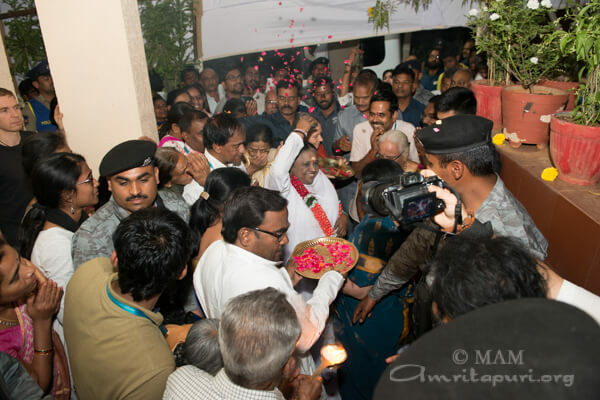 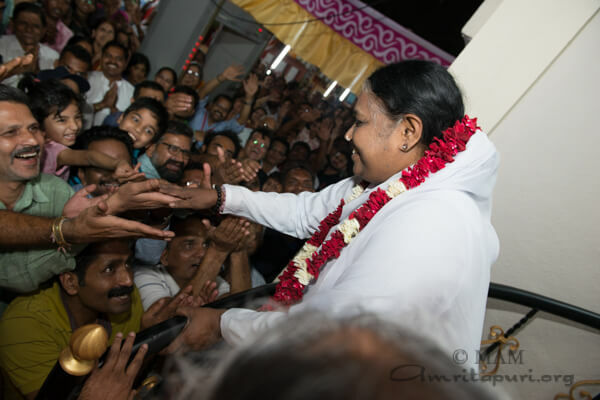 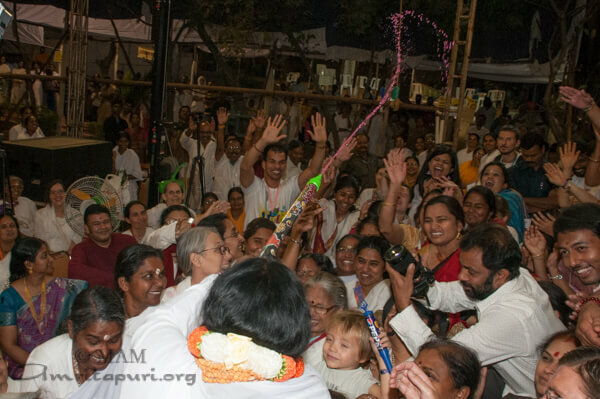 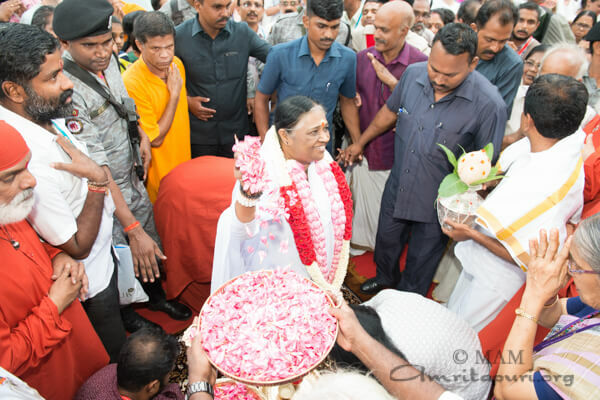 Amma arrived in Hyderabad just before midnight to a crowd of devotees that had gathered to welcome her. 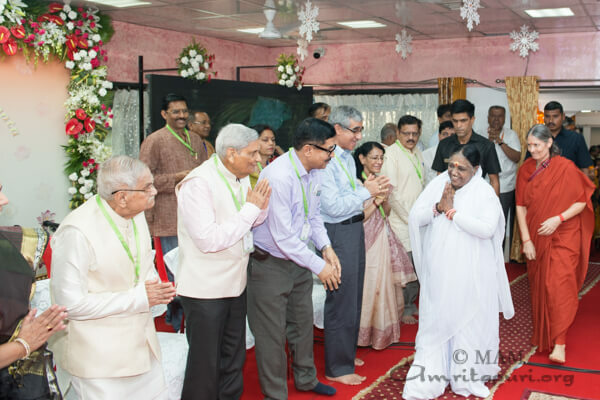 The next morning, Irrigation Minister, T. Harish Rao, and Special Advisor to the State Government, S. Venugopalachary, were to meet Amma on her first day of scheduled programs. 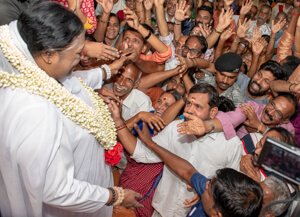 Amma appreciated the effort put forth by the state government in their aim to prioritize much-needed irrigation projects. 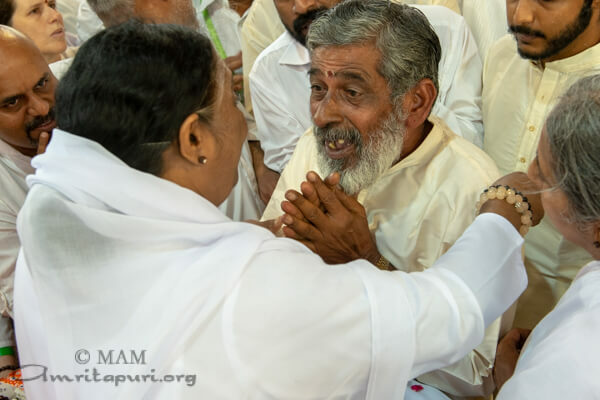 In a private meeting, Harish Rao asked Amma to give her blessings for the irrigation projects, which supply much needed agricultural water to farmers. 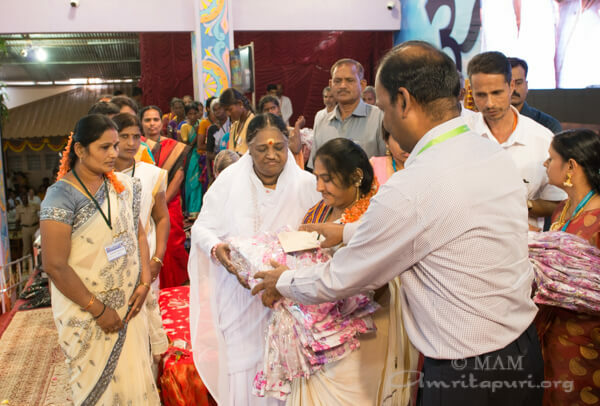 As part of the Amrita Serve project, MAM has adopted Kodur village in the Medak district and Gudipaticheruvu in the Guntur district of Andhra Pradesh. 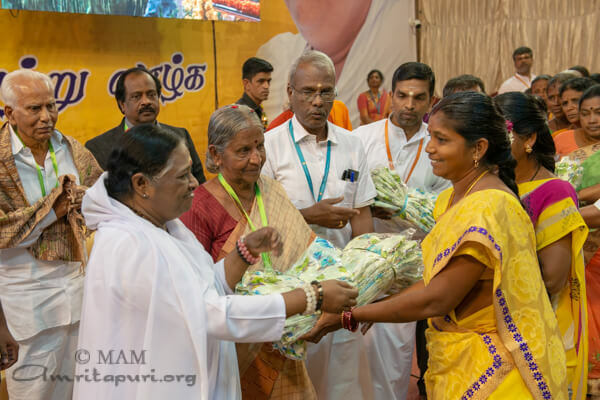 In Kodur village, Amma has initiated a program that trains locals to produce low-cost, biodegradable sanitary napkins, and, separately, has begun providing tuition for children from kindergarten age to Class 10. 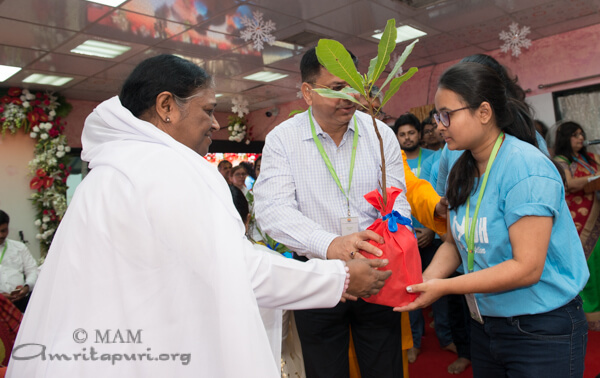 Amrita Serve also installed a compressed mud block manufacturing unit, which serves as a durable, eco-friendly alternative to the existing bricks. 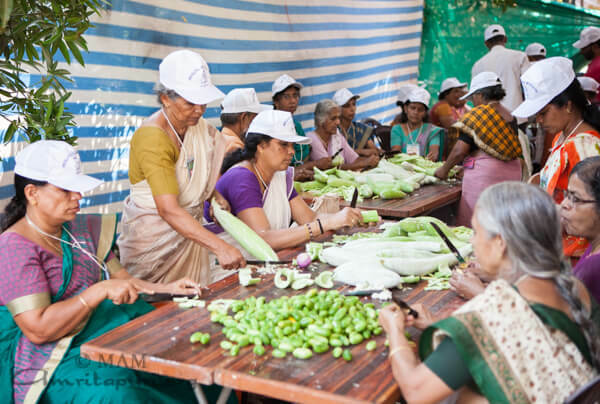 The unit is enabling villagers to earn a livelihood. 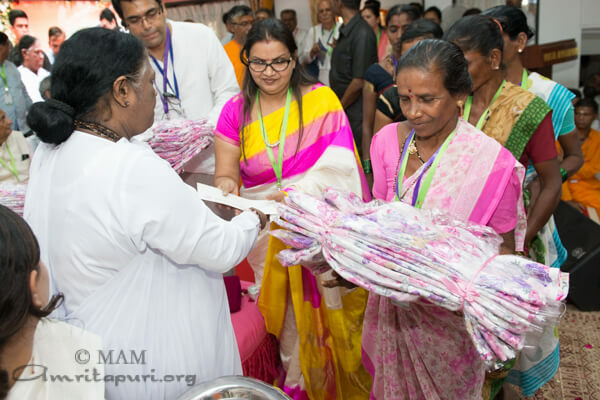 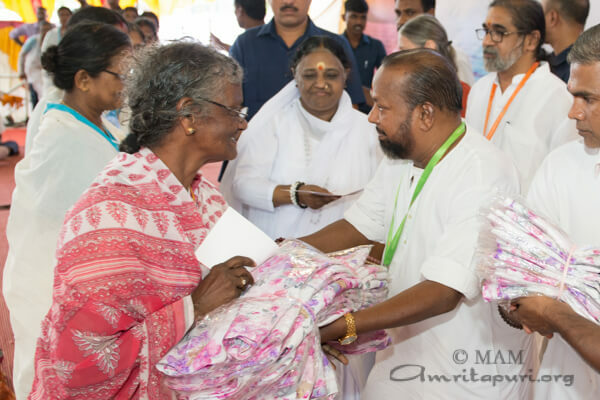 Amma distributed saris and working capital to the AmritaSREE Self-Help Group members, and AYUDH members were given saplings to promote organic farming. 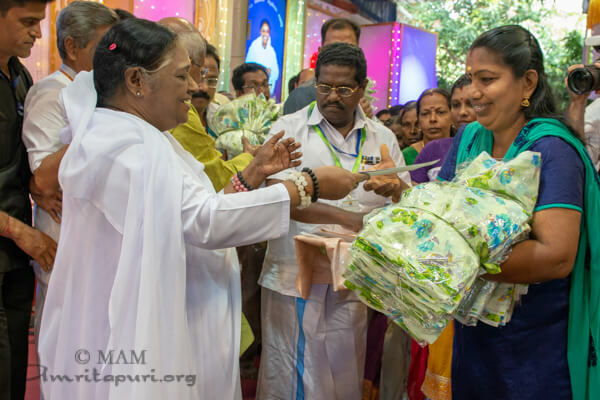 Biodegradable sanitary napkins made by the Amrita SeRVe project were also distributed to the teenage girls in attendance. 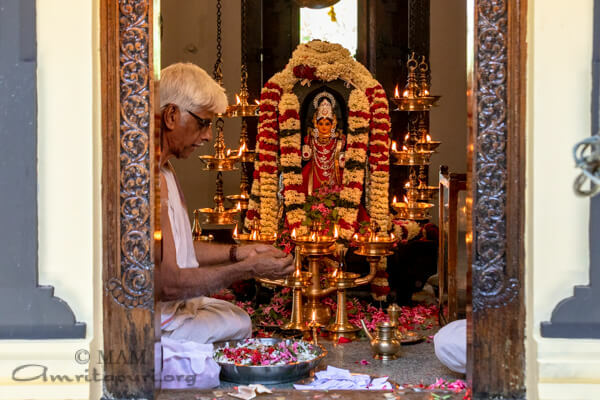 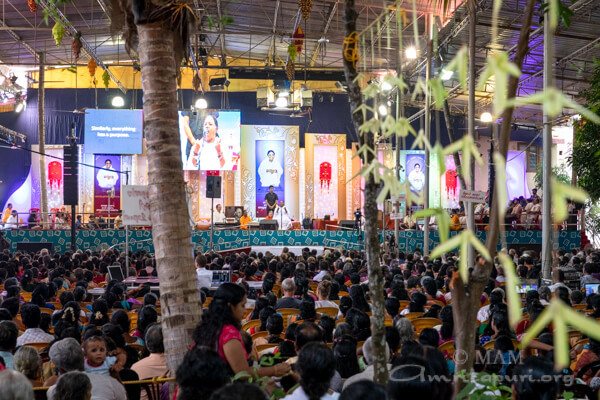 Amma led all in a meditation and Manasa puja, delivering the instructions in Telugu (the local language). 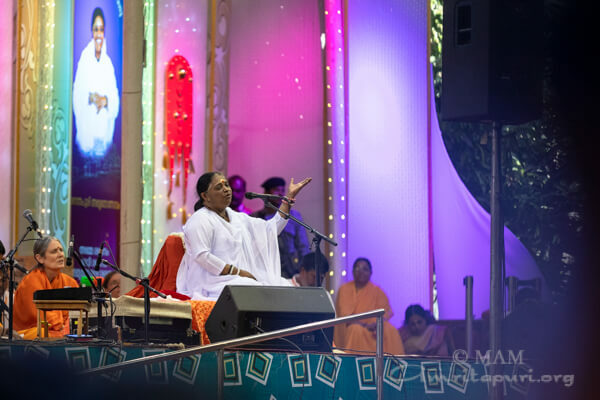 Her Satsang was translated into Telugu and she also sang a number of Telugu bhajans. 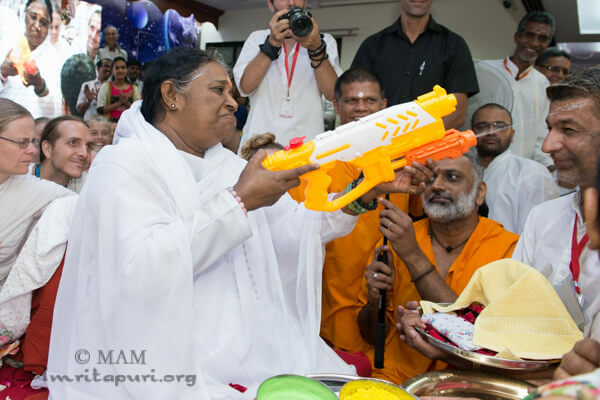 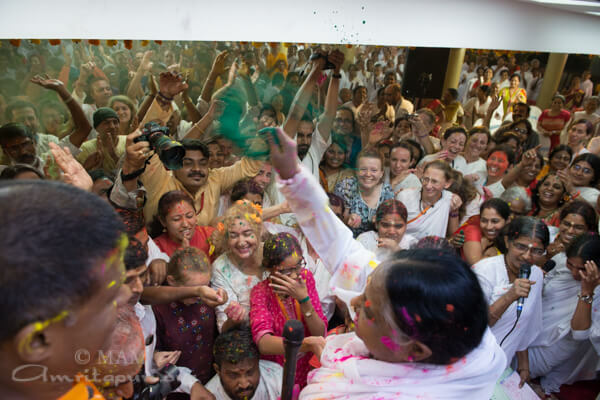 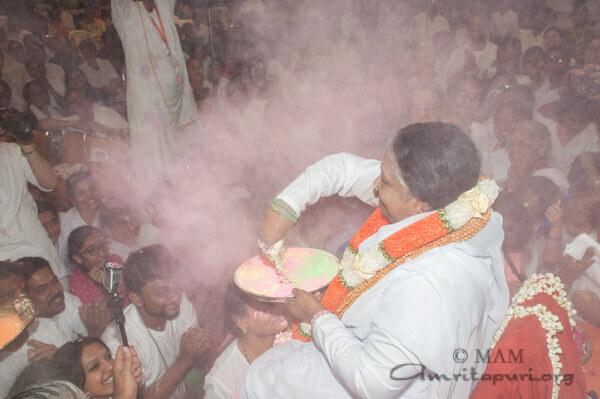 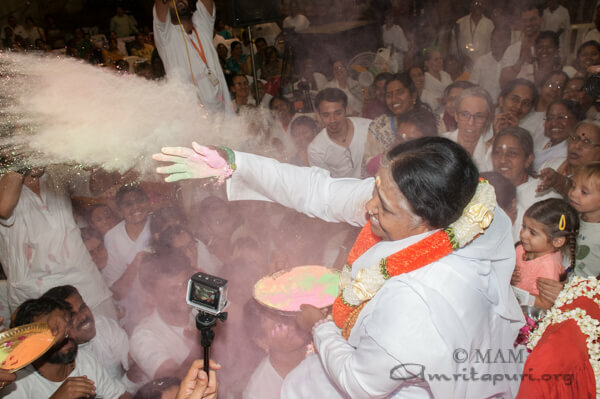 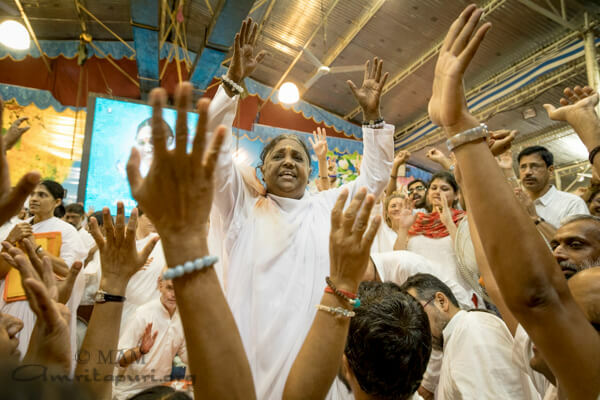 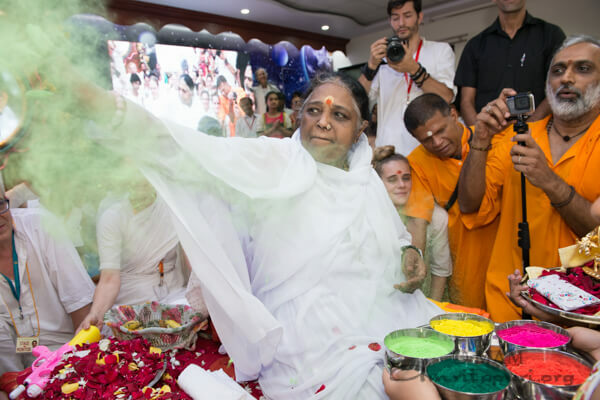 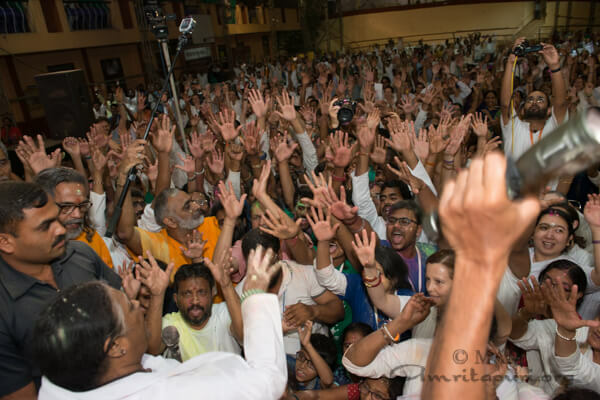 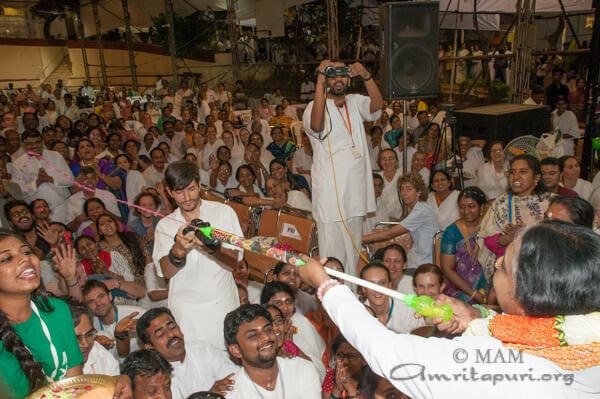 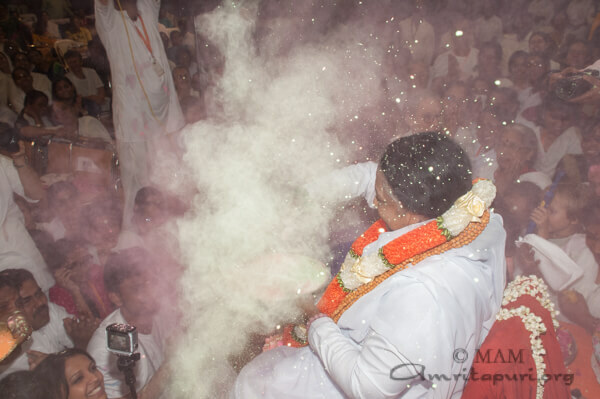 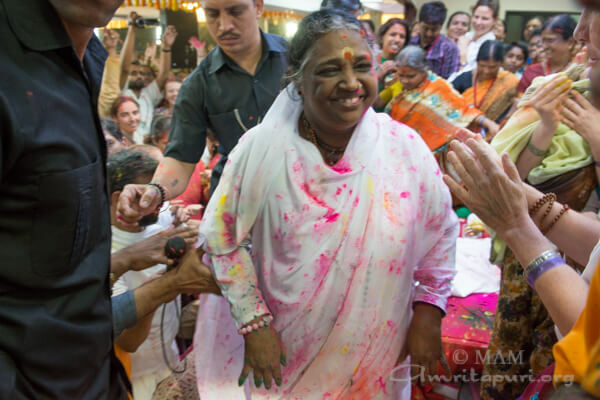 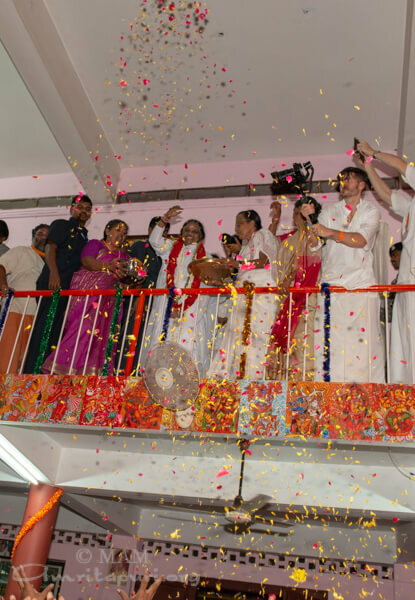 Finishing the Hyderabad program with an ecstatic Holi celebration, Amma and the tour group departed the city for the next stop in Pune. 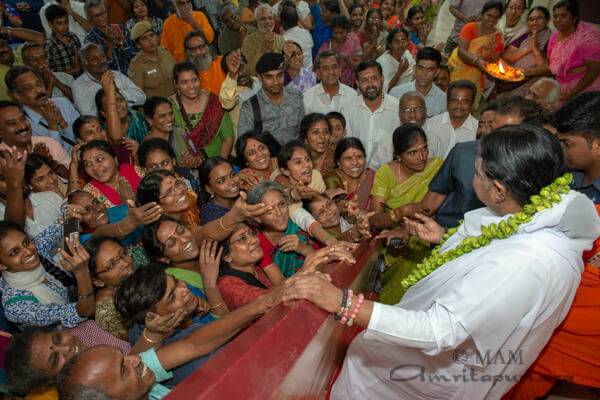 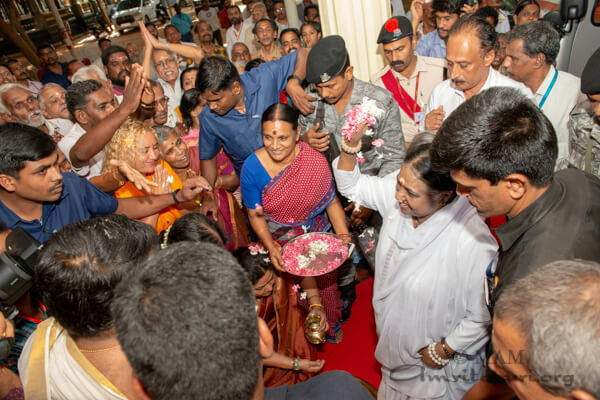 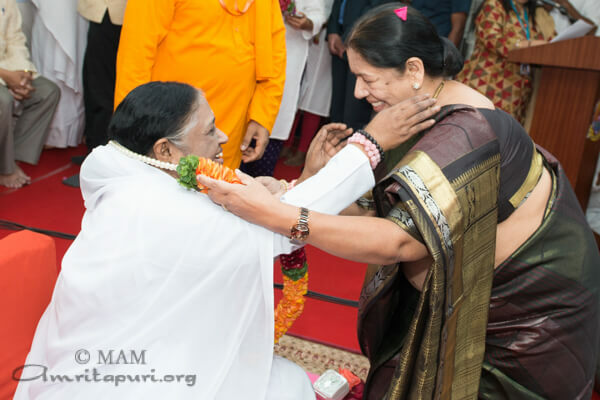 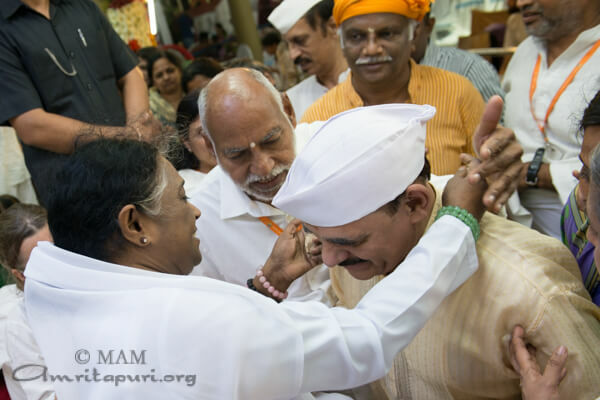 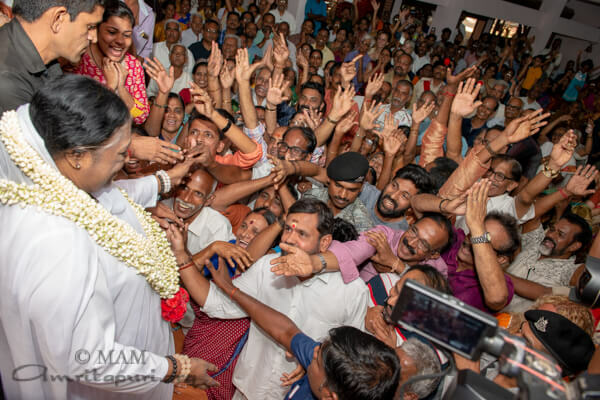 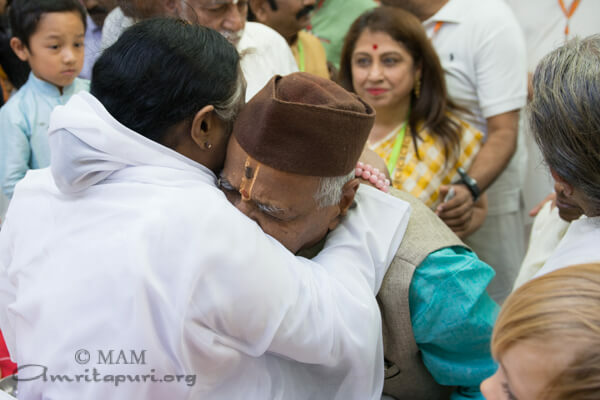 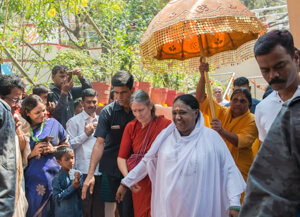 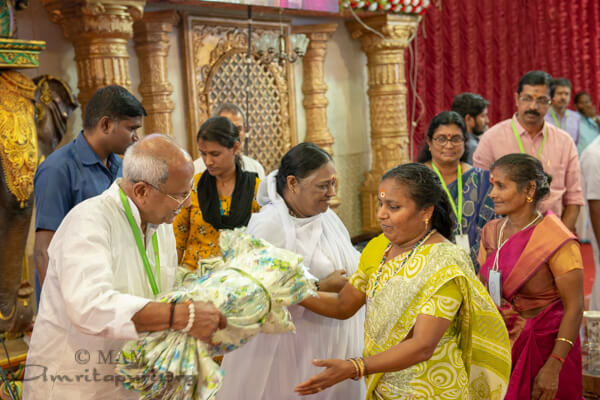 Despite the fact that Amma reached Bengaluru in the early hours of the morning, a group of devotees were patiently waiting there with tears in their eyes to greet her. 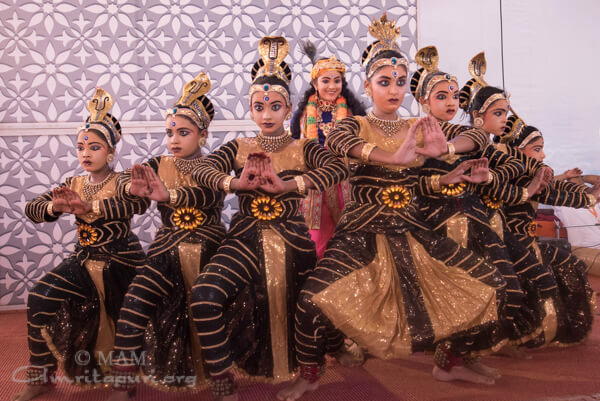 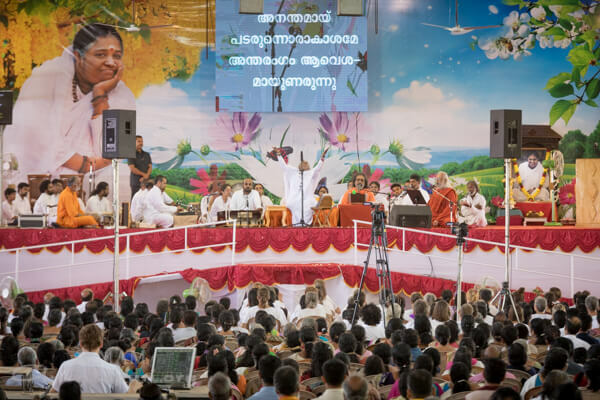 On the day of the program, Amma was welcomed to the stage with Vedic chants performed by the students of Amrita Vidyalayam. 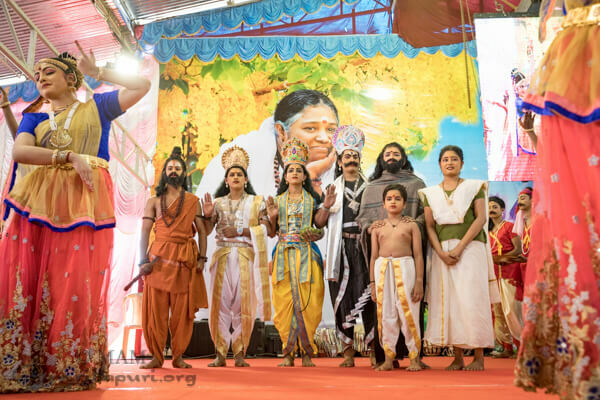 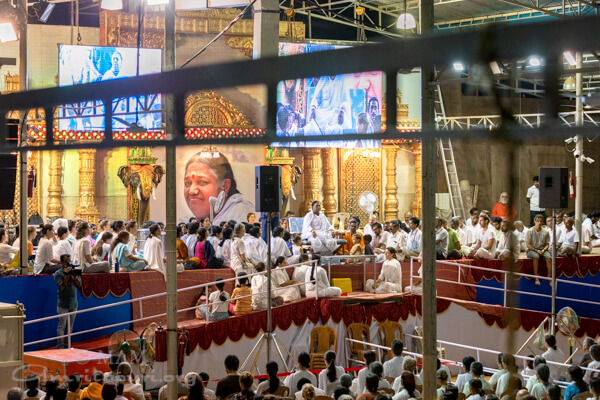 Amma guided a Manasapuja and meditation in Kannada, and also sang many Kannada bhajans. 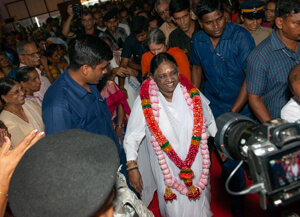 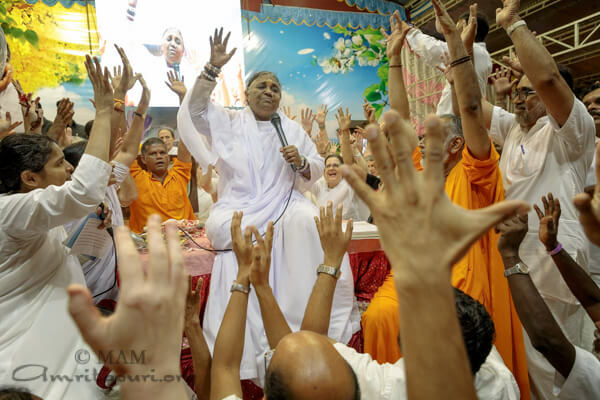 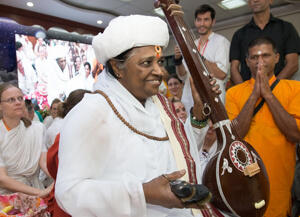 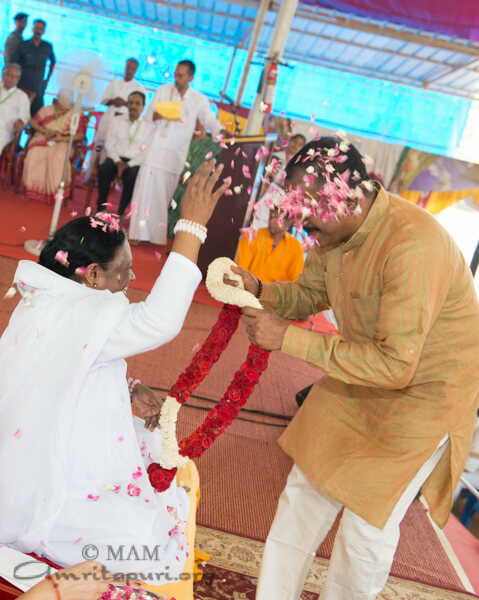 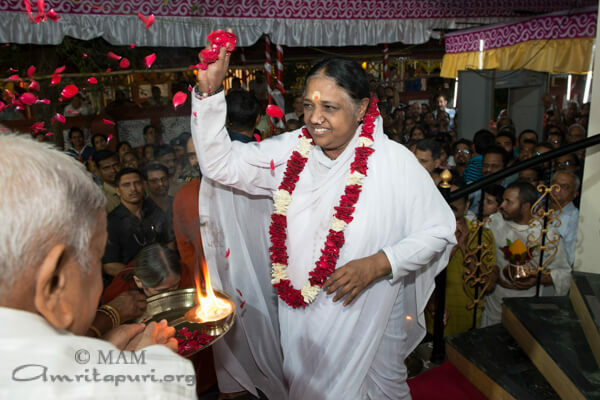 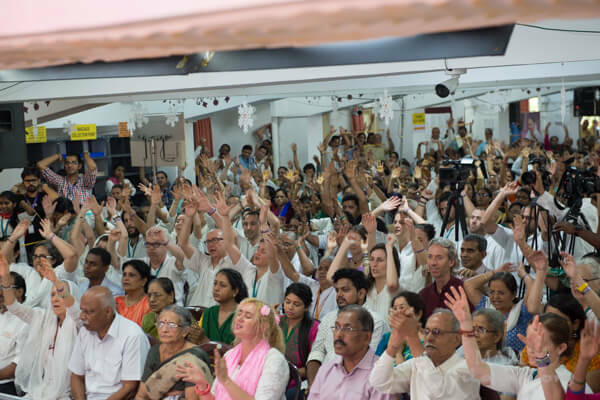 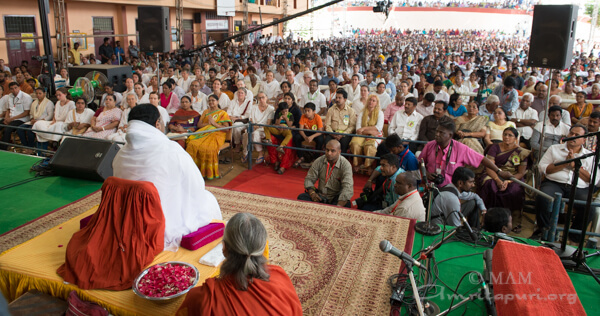 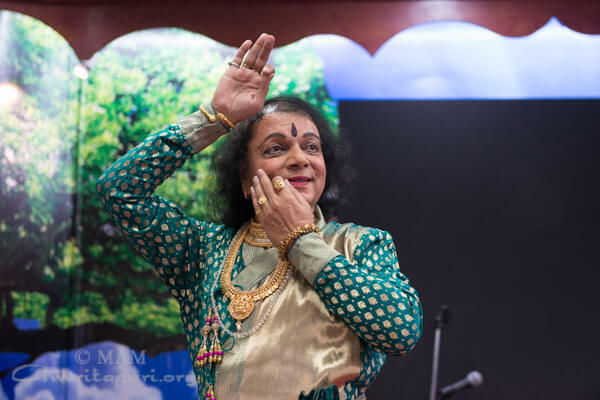 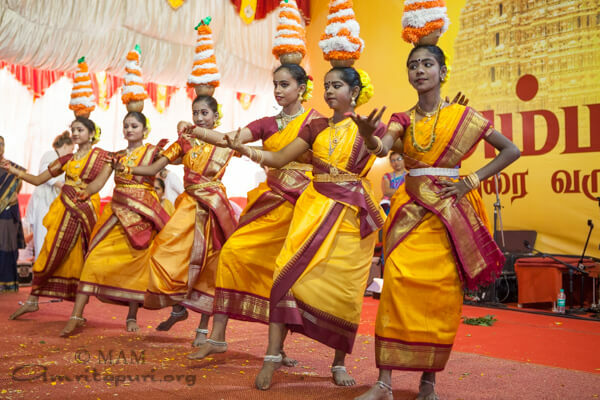 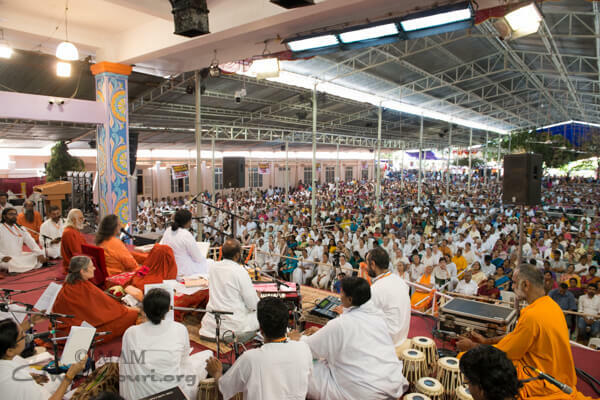 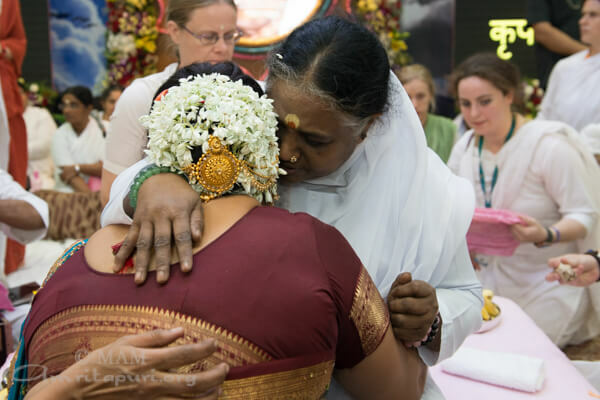 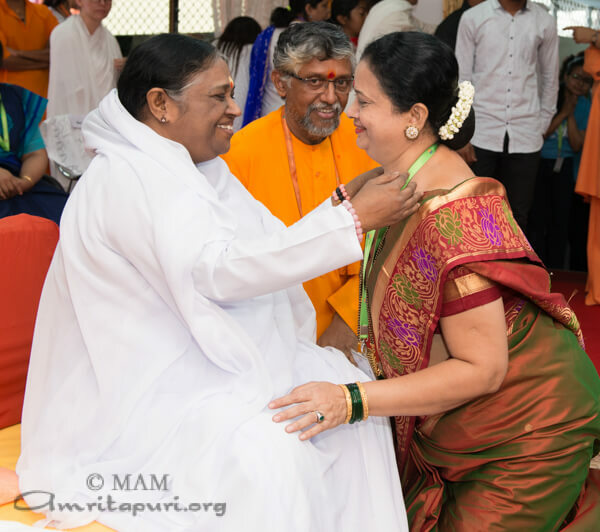 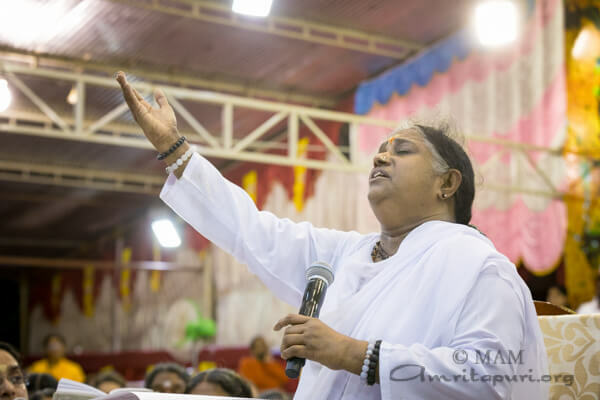 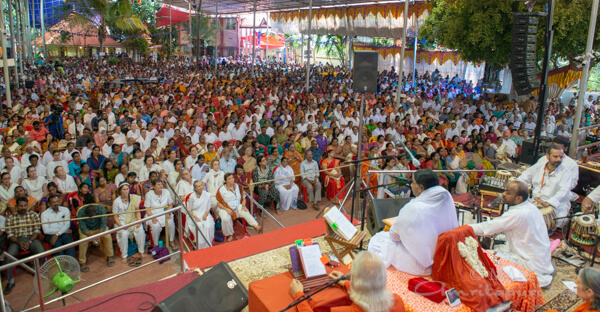 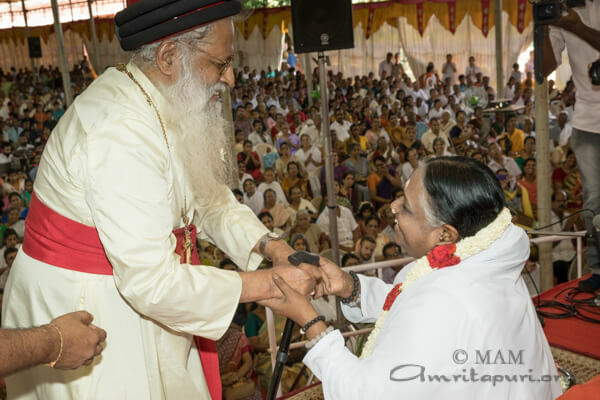 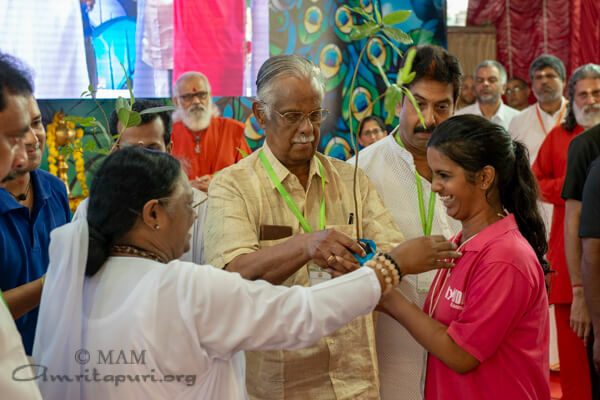 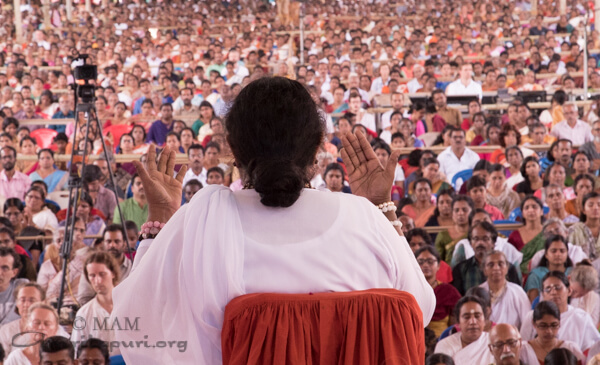 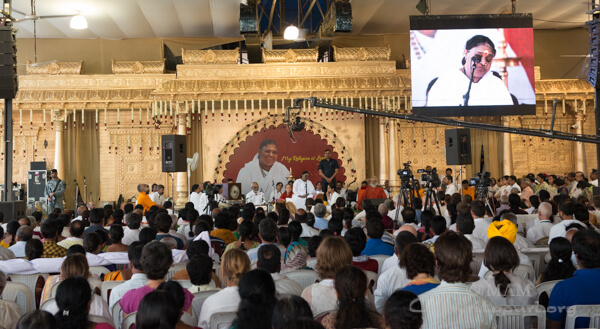 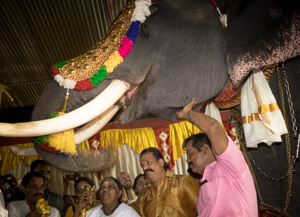 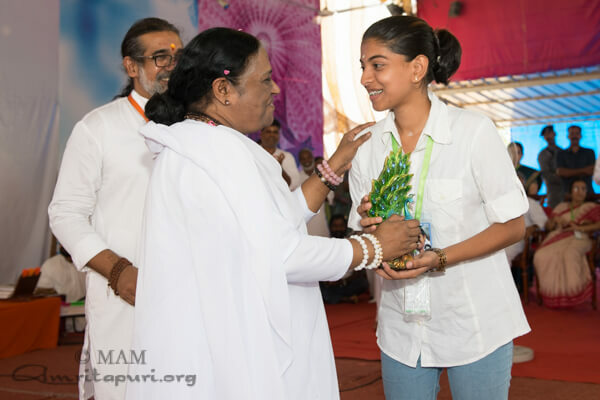 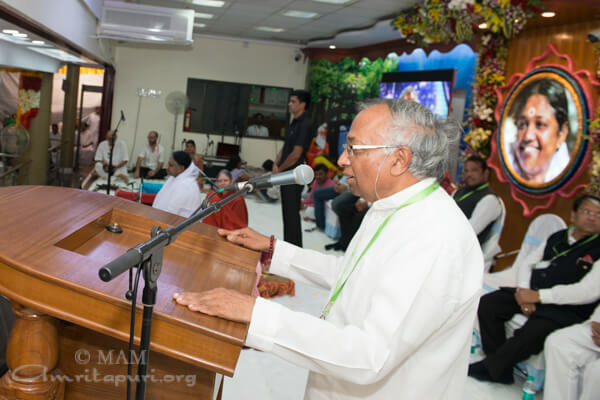 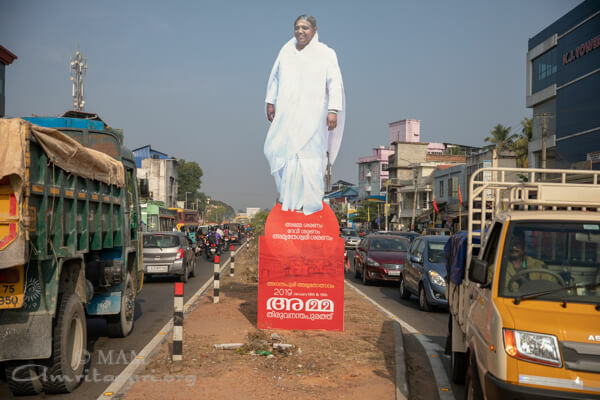 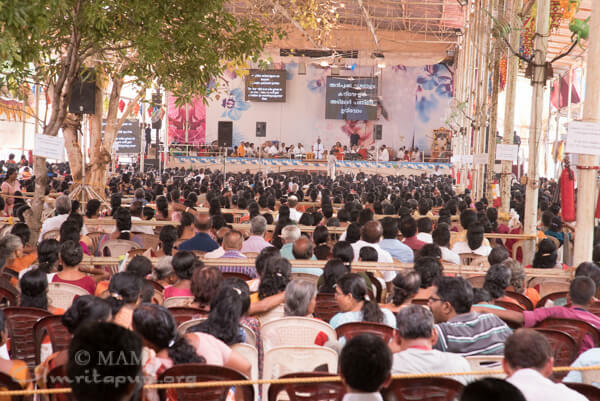 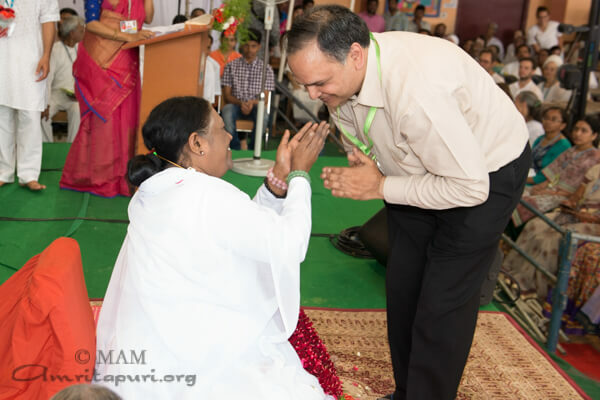 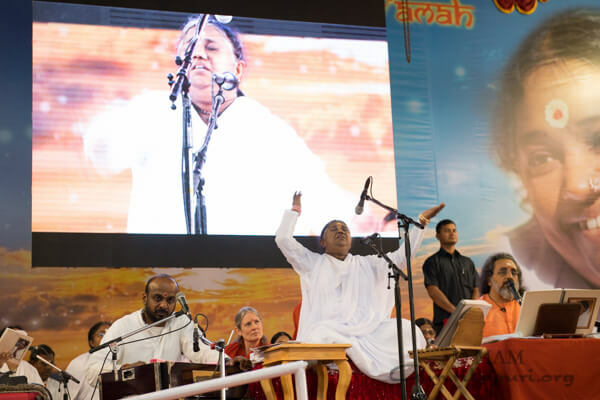 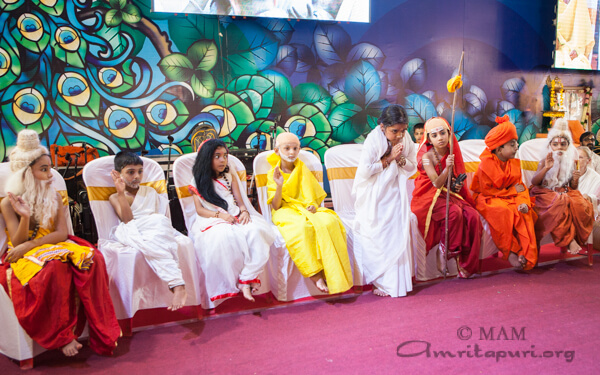 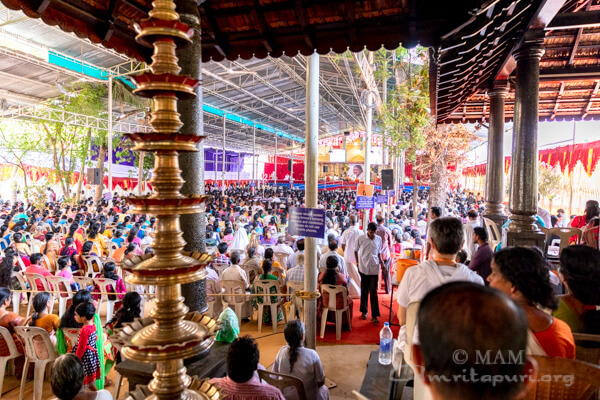 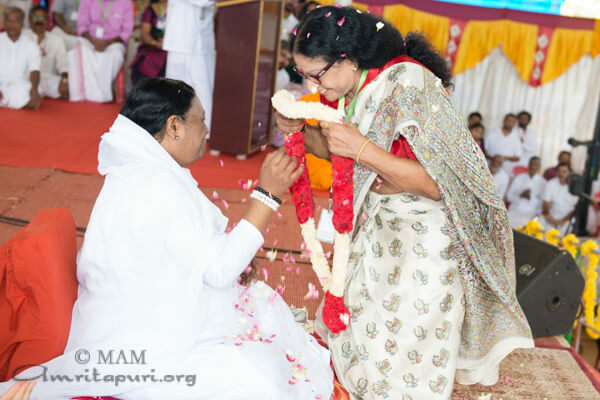 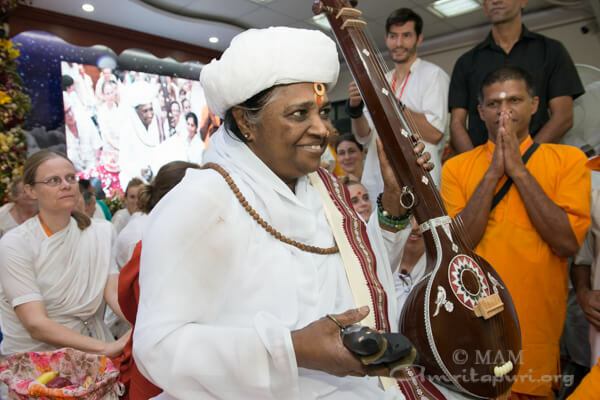 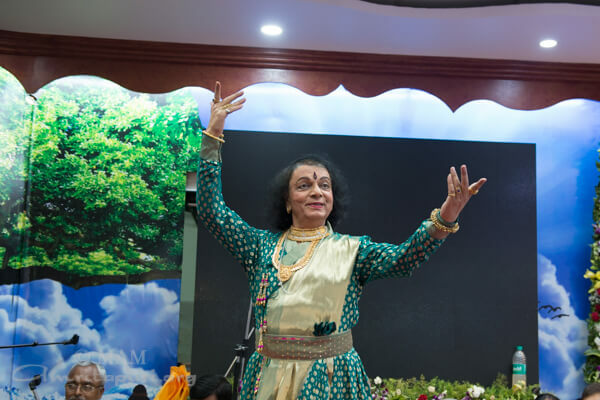 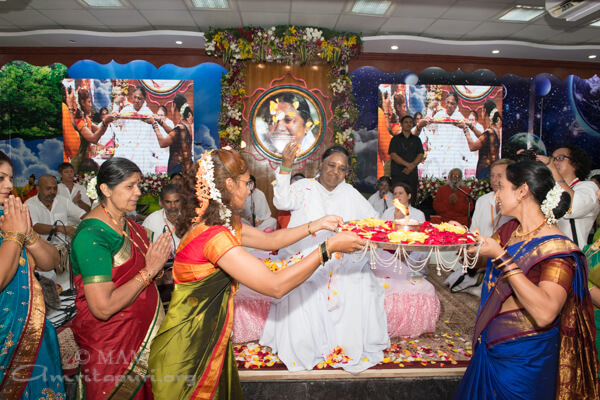 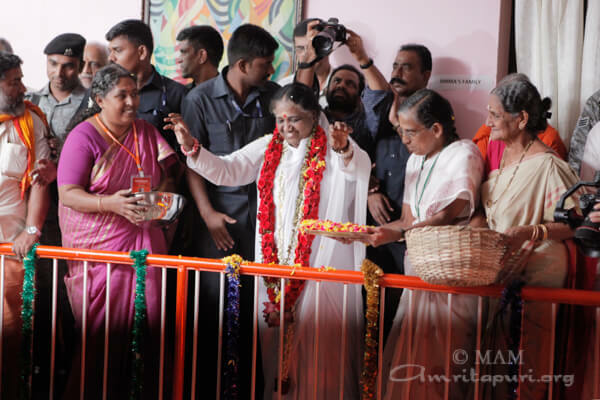 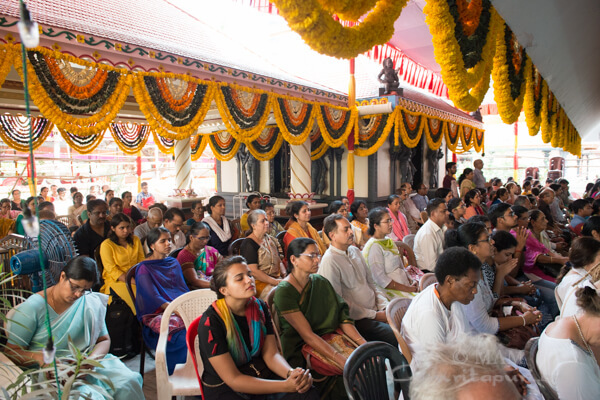 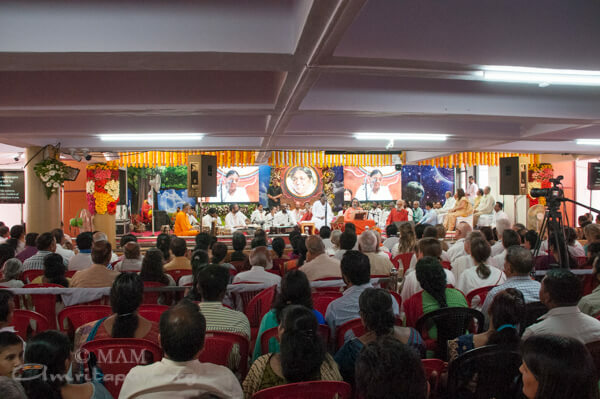 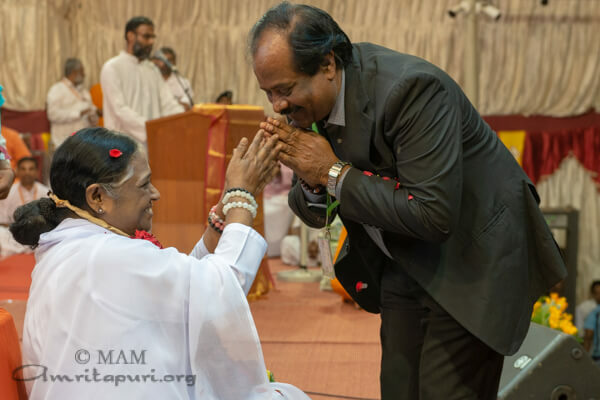 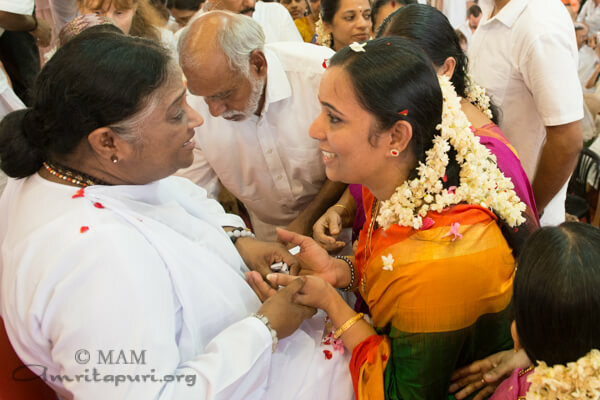 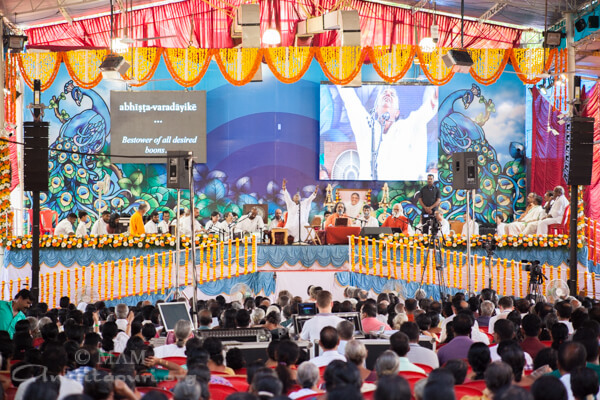 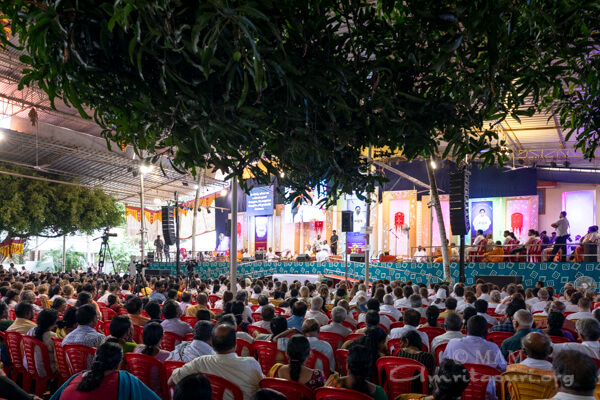 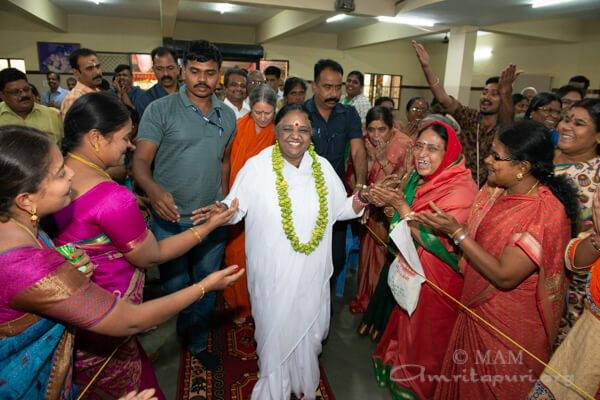 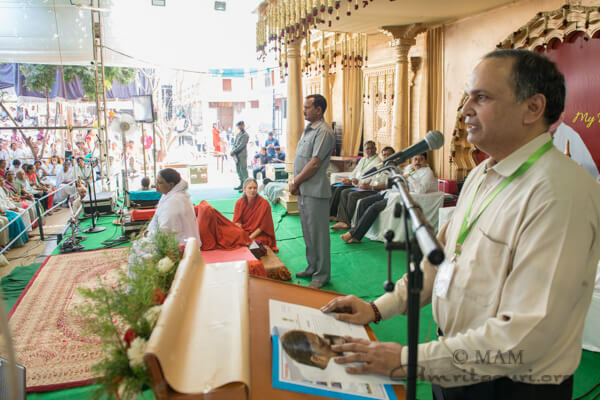 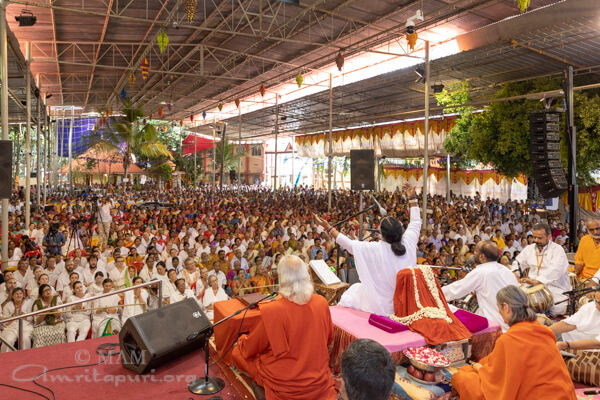 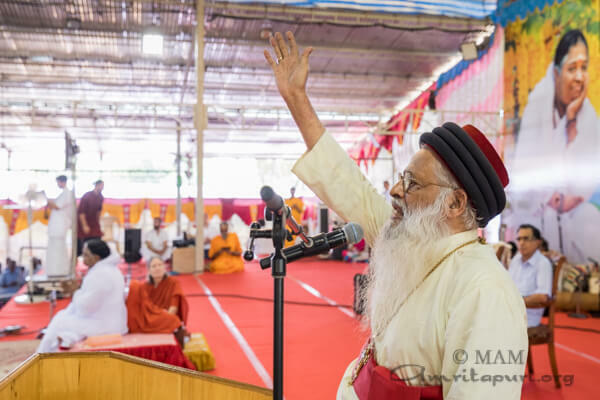 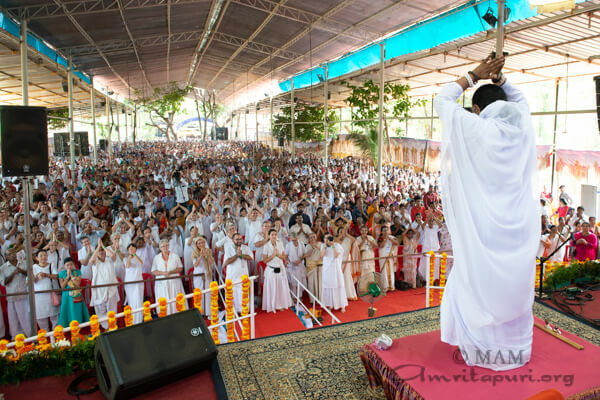 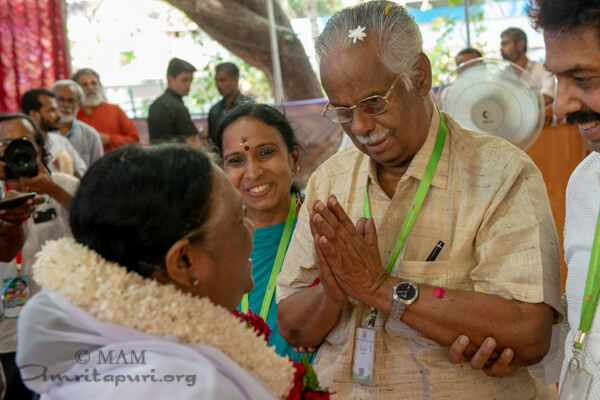 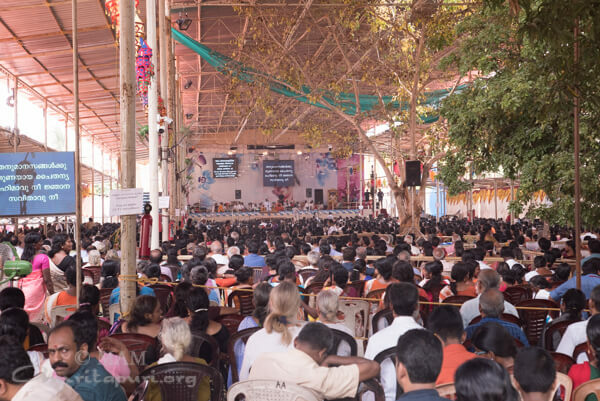 Speaking on the occasion, Amma noted that drawing inspiration from nature teaches us to “live in harmony,” while the modern world teaches us to, “live only for ourselves.” “Our mind is a great servant, but a poor master,” she went on to say, “and with growing attachment towards external pleasures, our mind weakens. 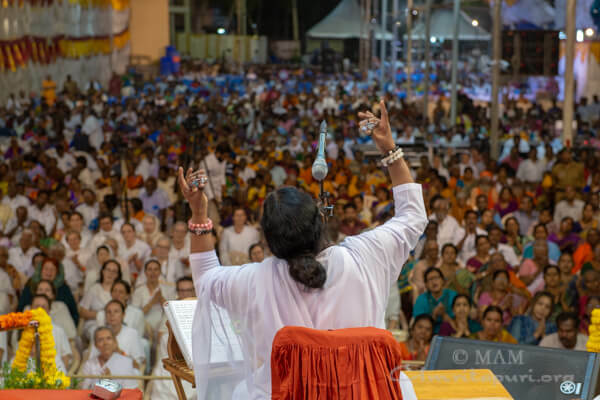 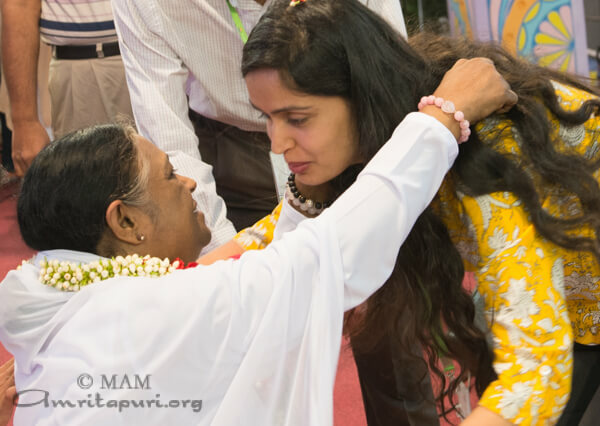 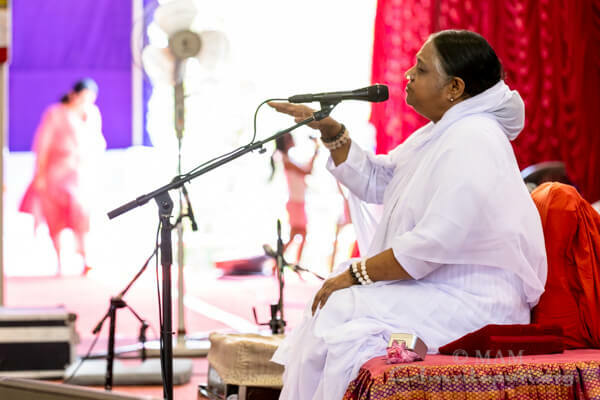 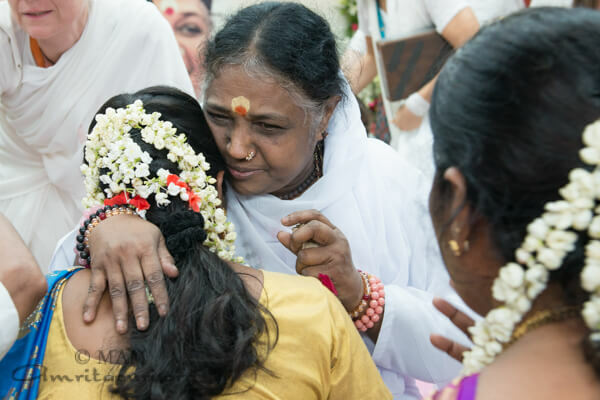 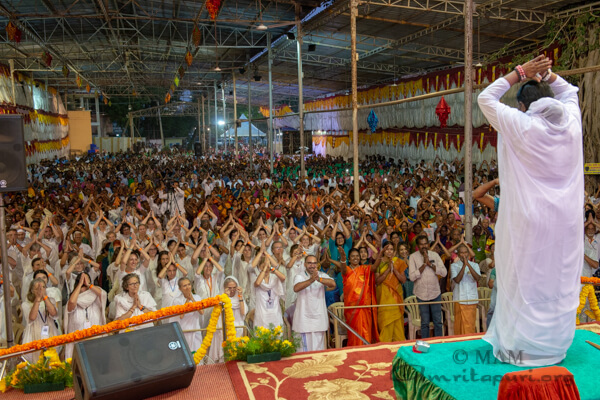 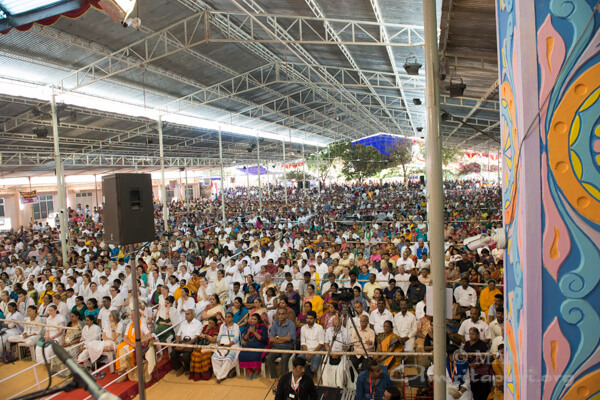 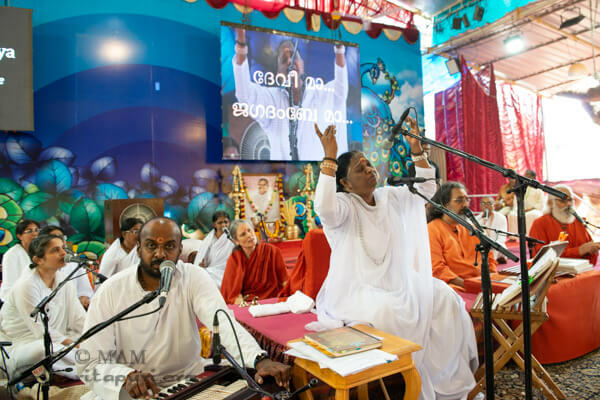 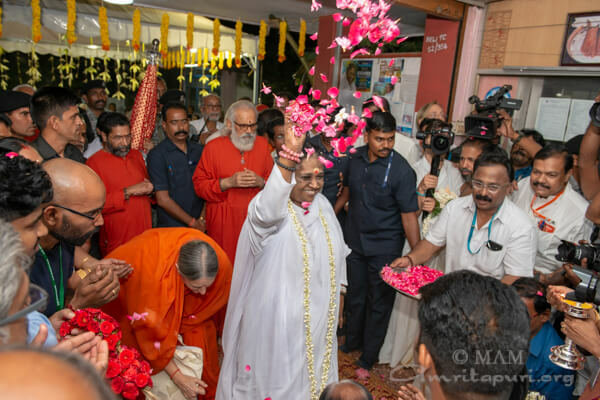 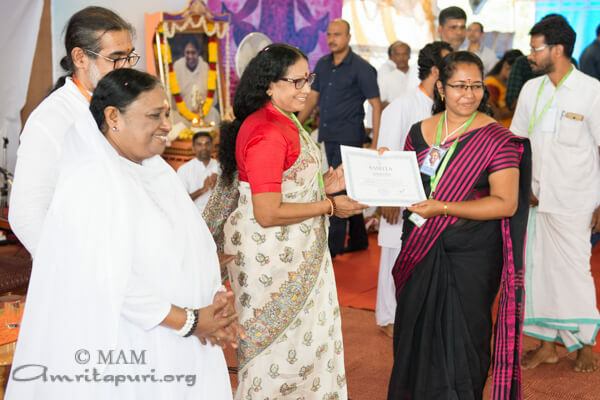 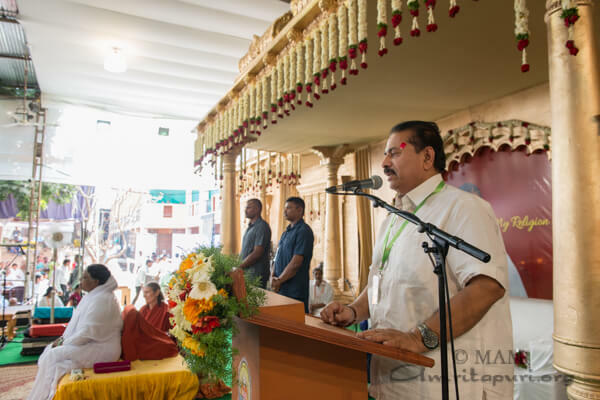 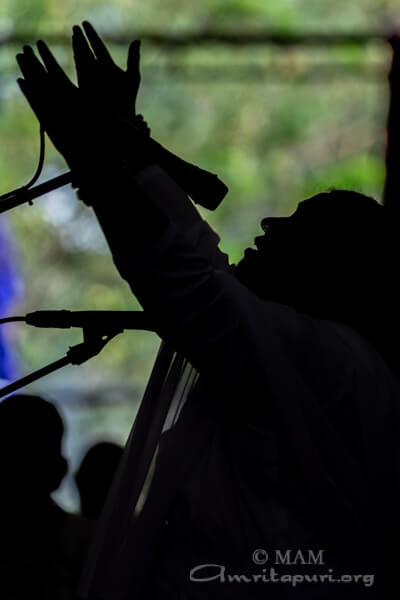 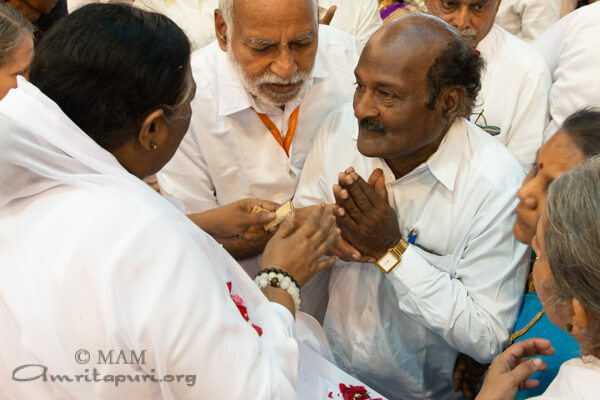 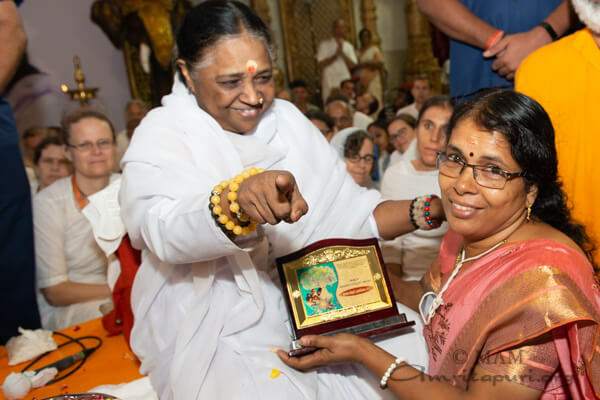 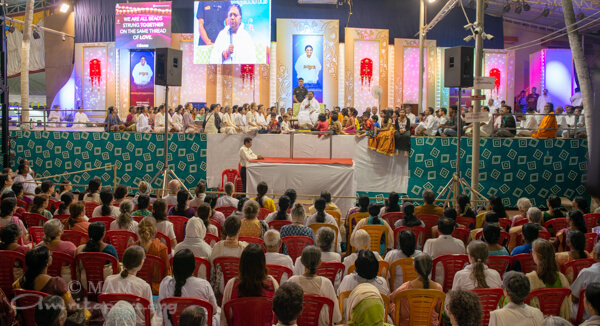 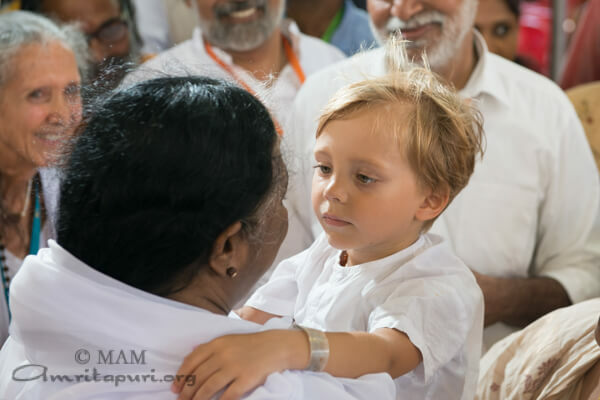 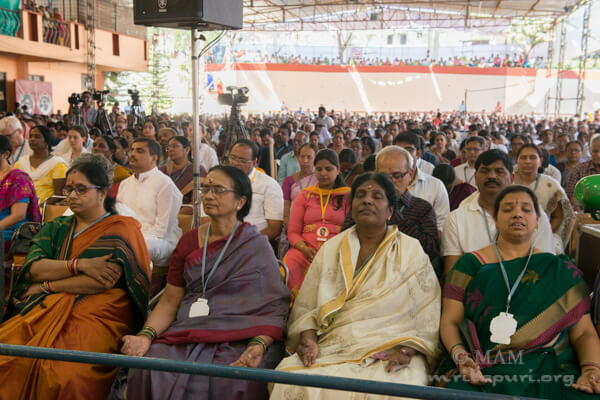 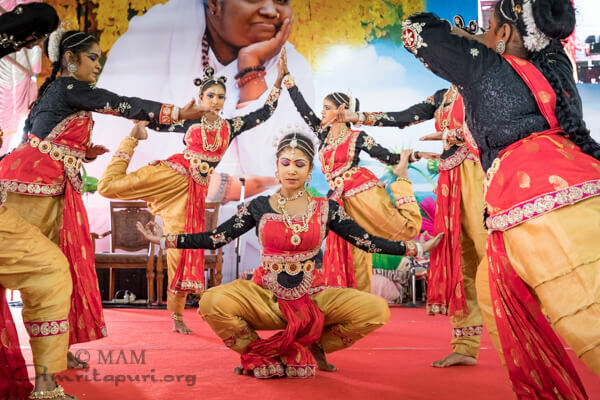 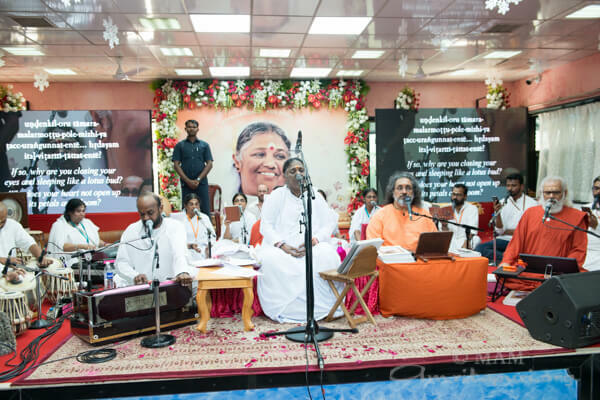 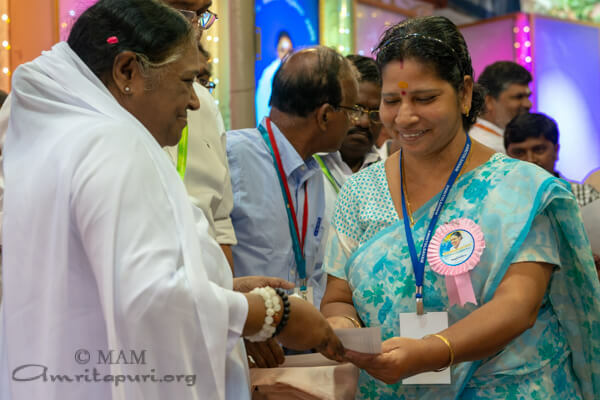 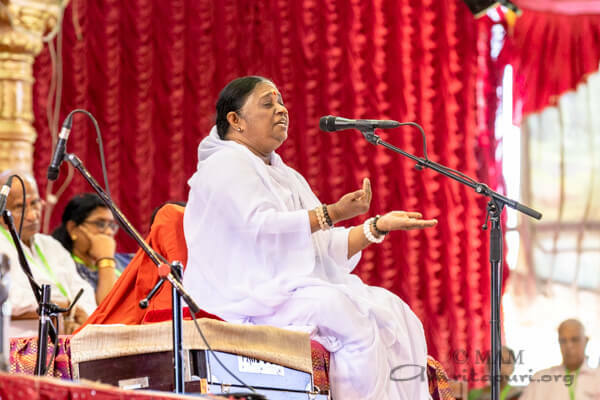 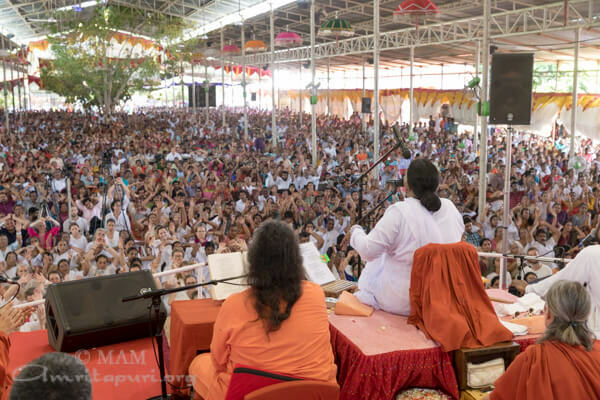 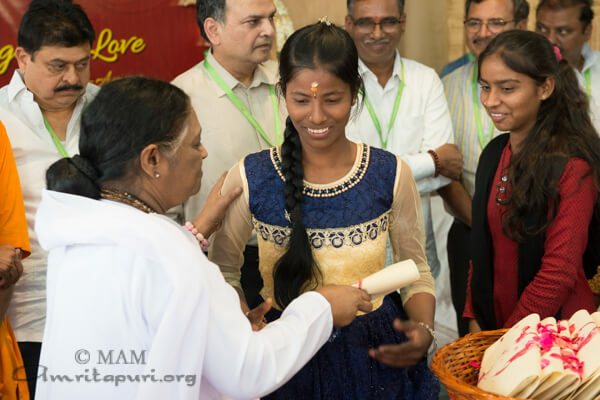 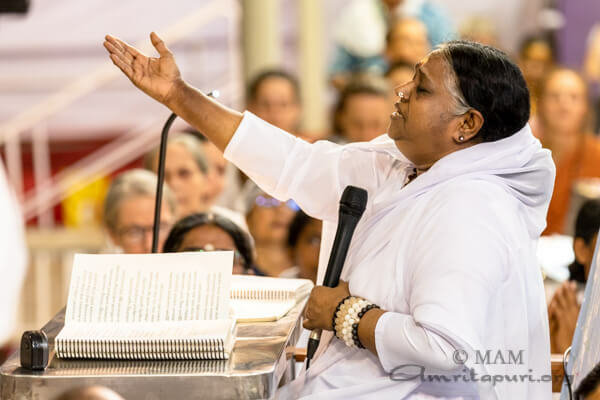 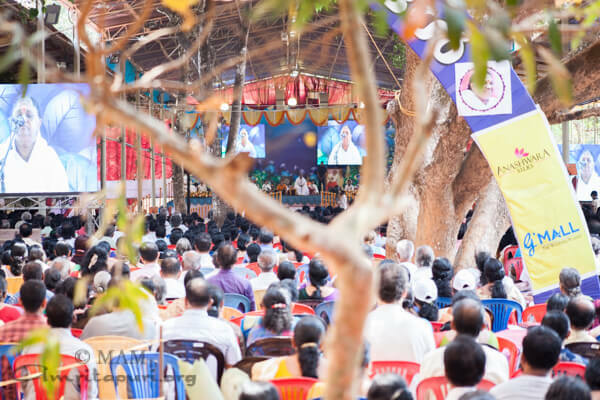 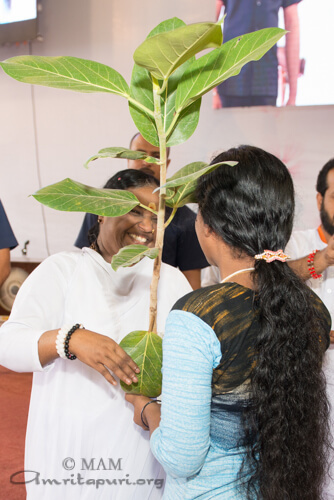 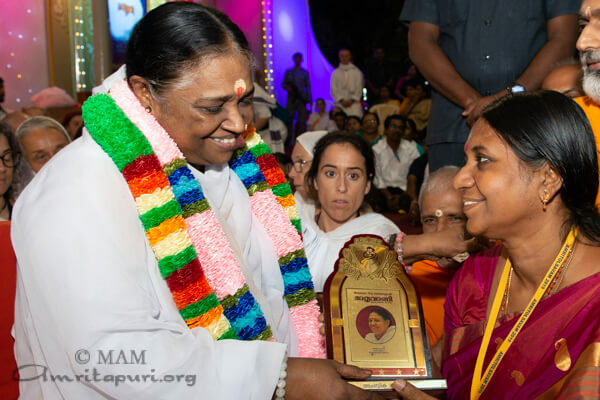 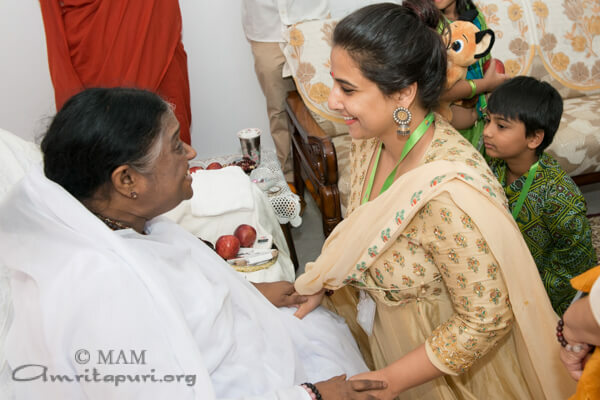 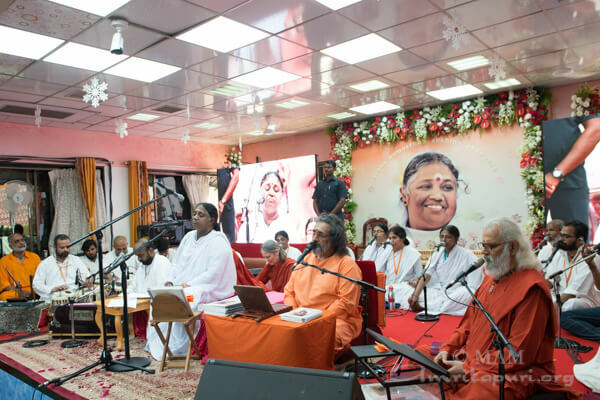 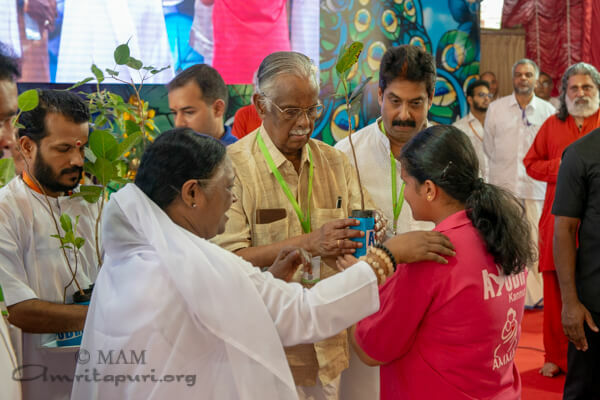 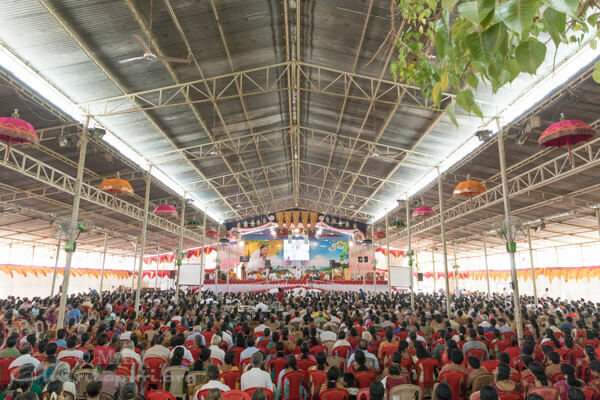 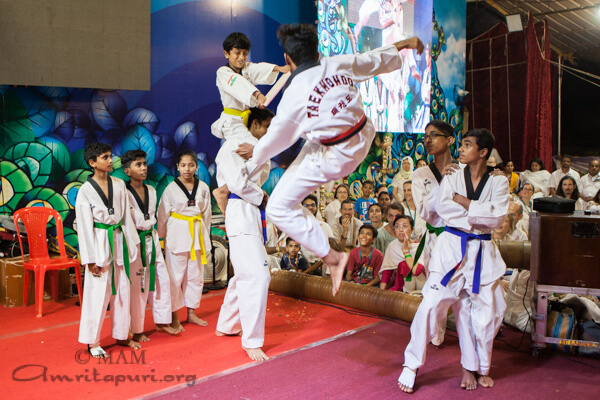 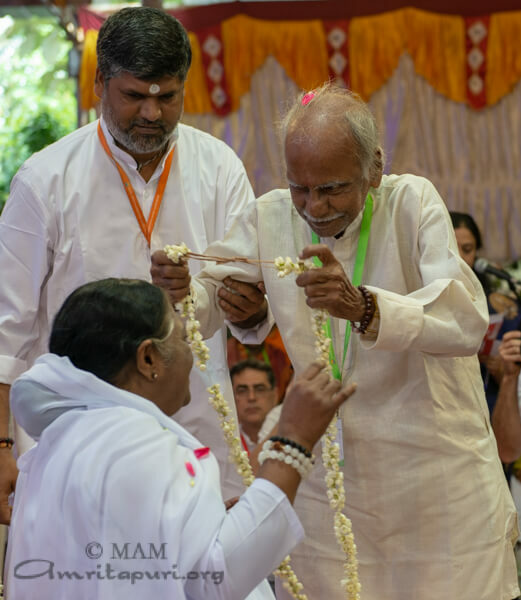 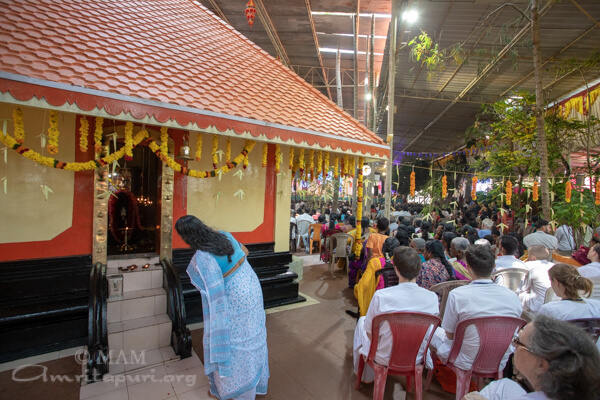 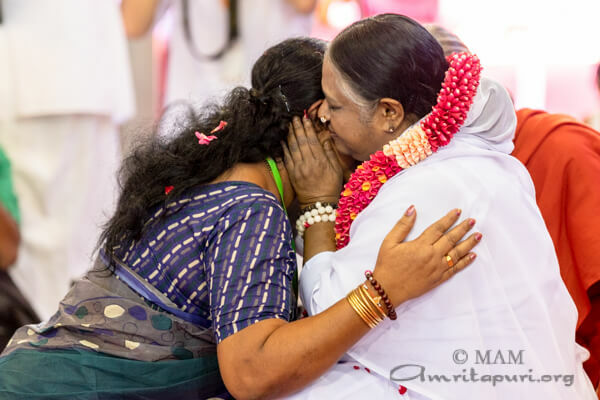 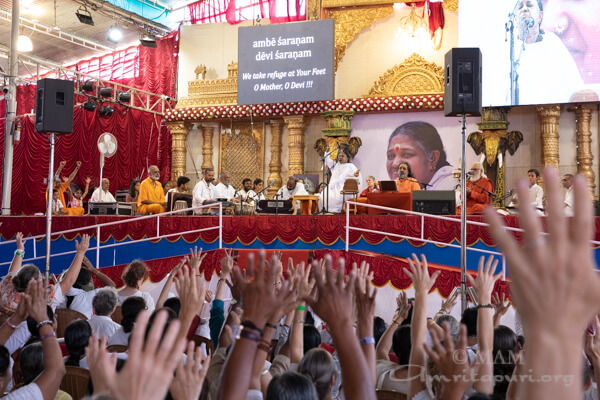 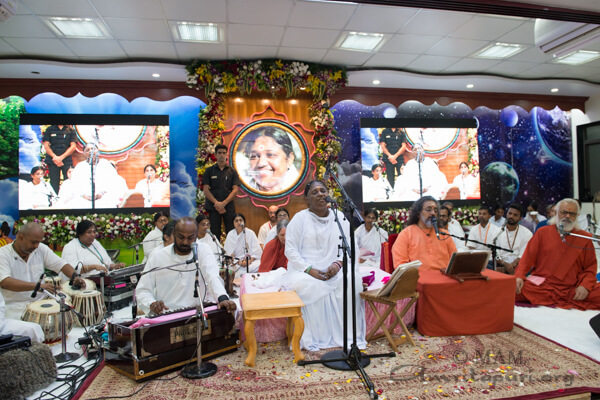 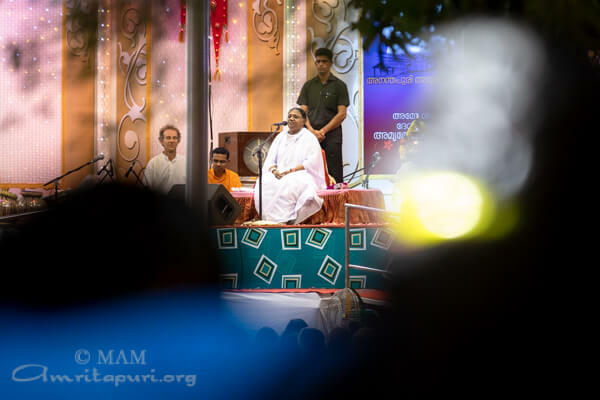 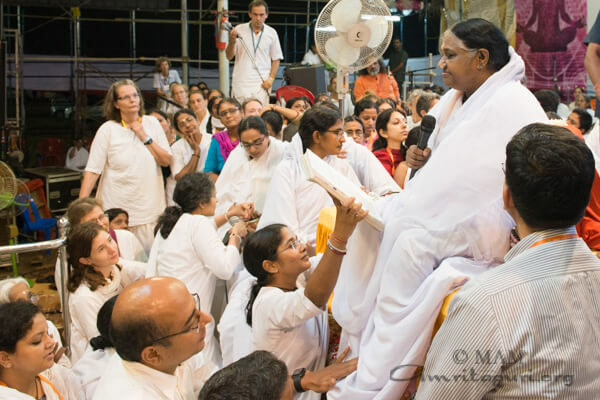 We have to live minimally and turn inward for inspiration.” Amma also highlighted the benefits of meditation, such as its ability to aid in the attainment of mental peace. 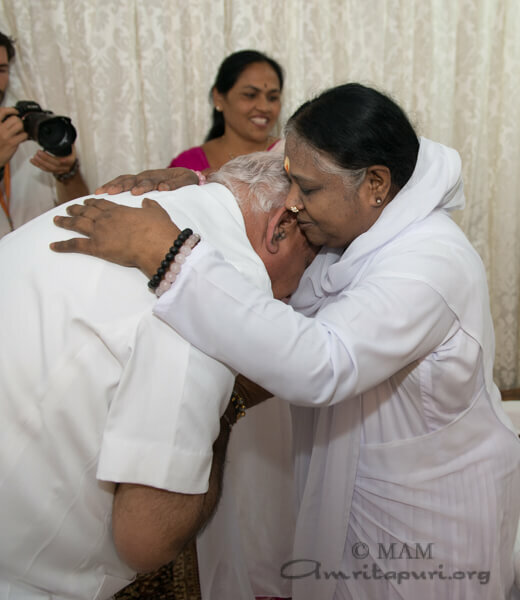 Former Chief Minister, B S Yeddyurappa, met Amma and sought her blessings. 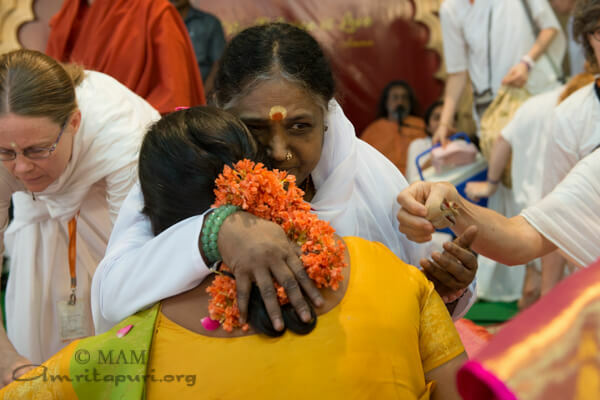 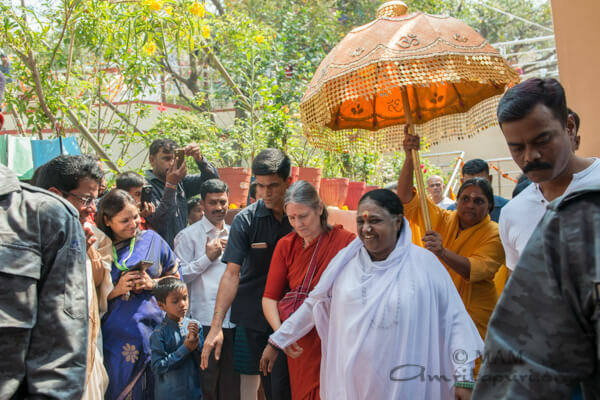 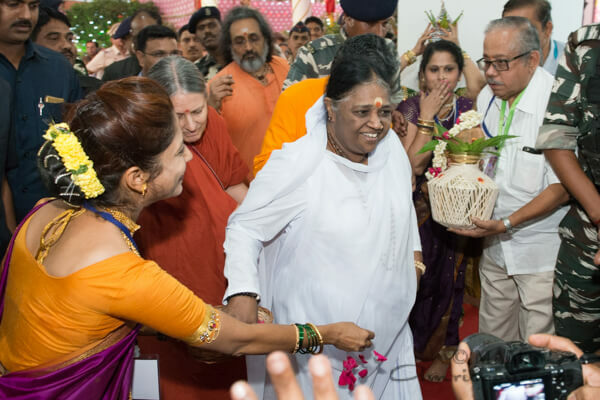 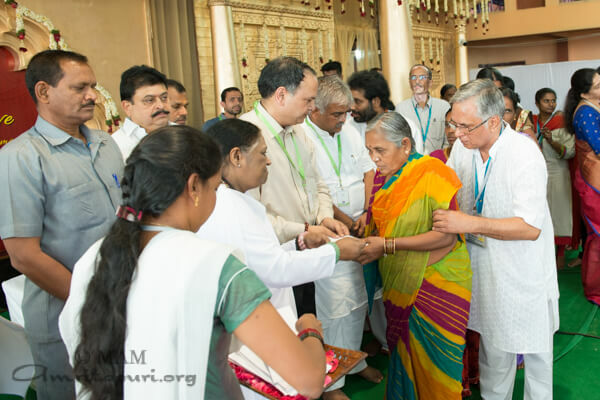 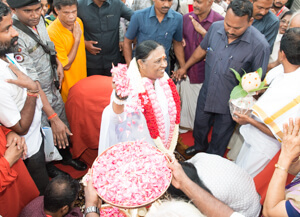 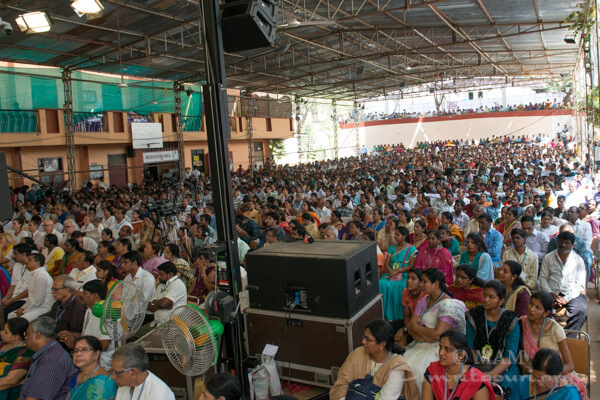 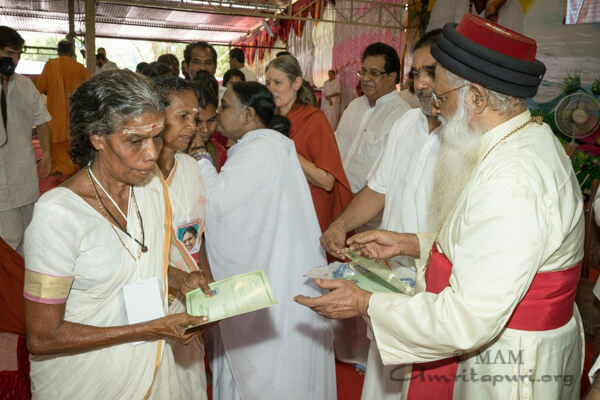 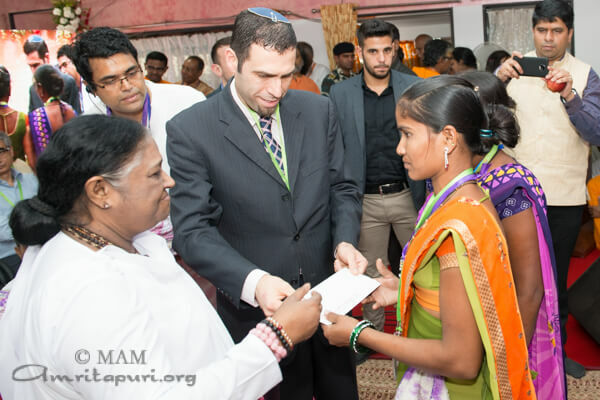 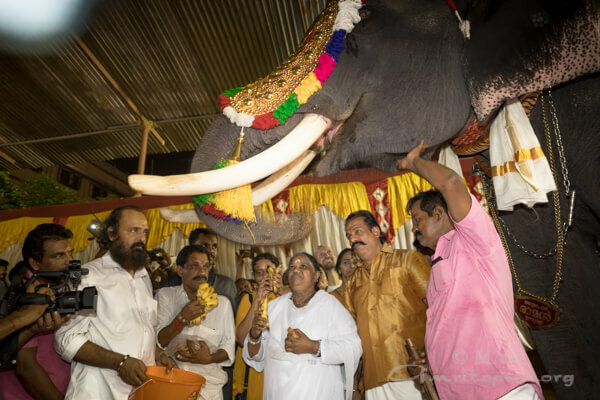 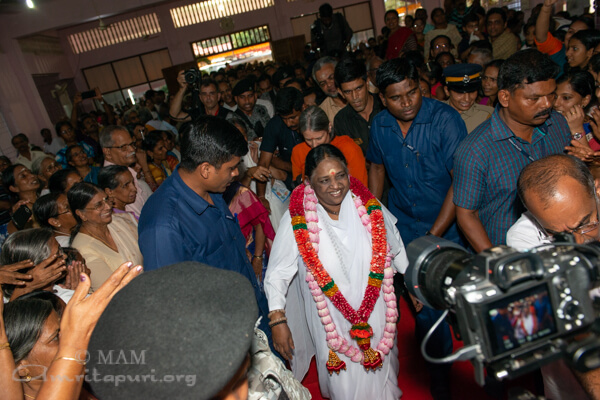 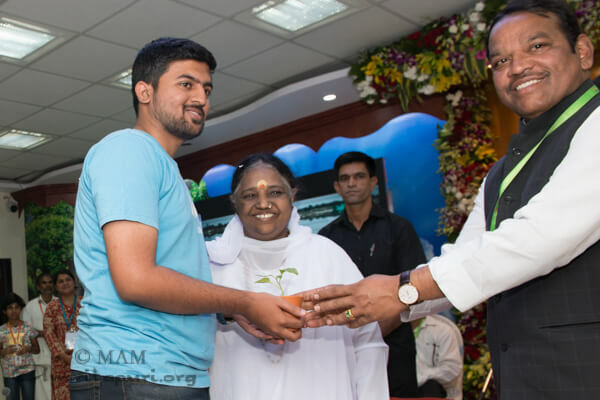 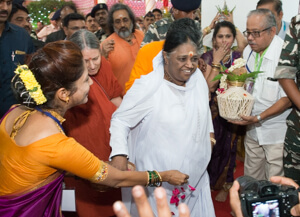 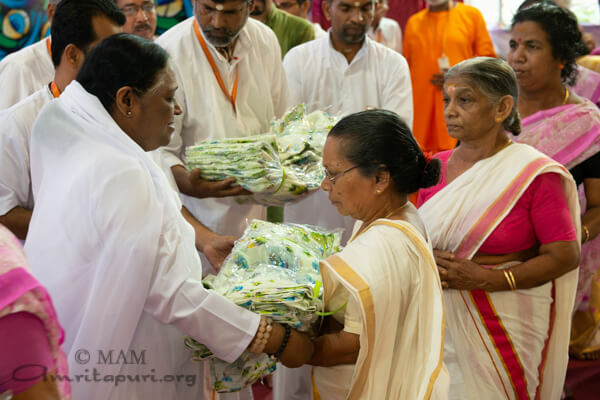 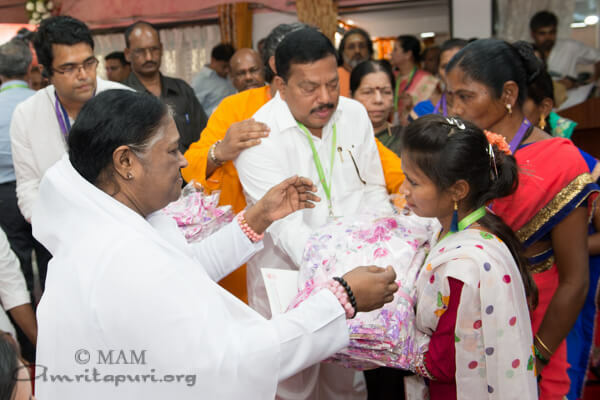 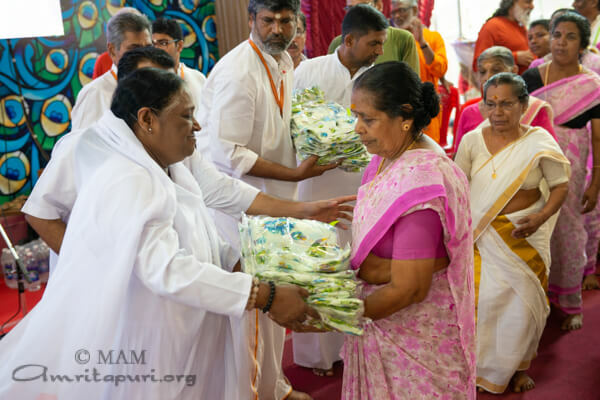 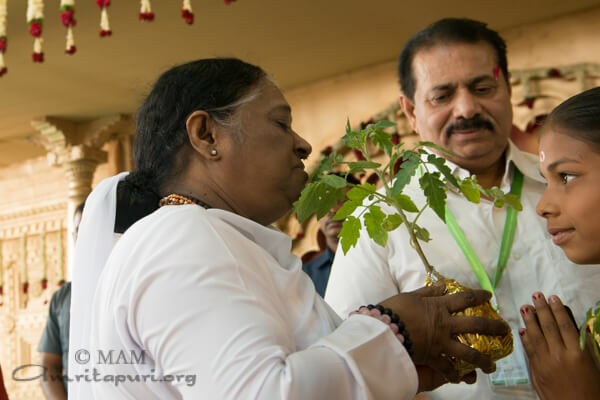 AYUDH members offered organic vegetables to Amma, which they had grown themselves. 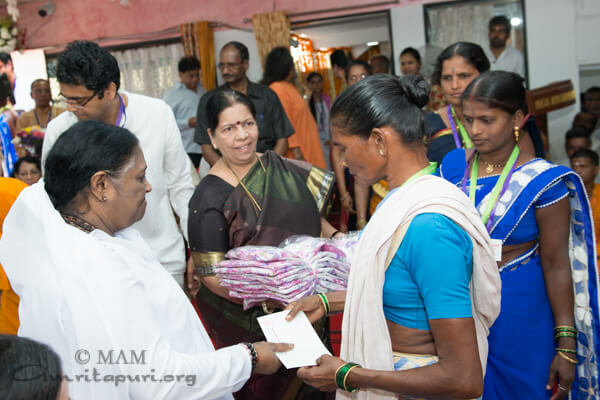 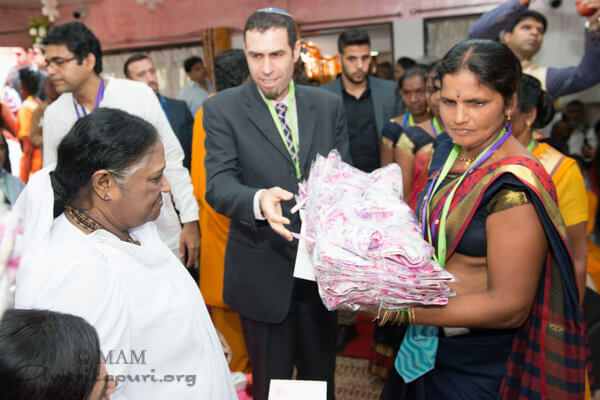 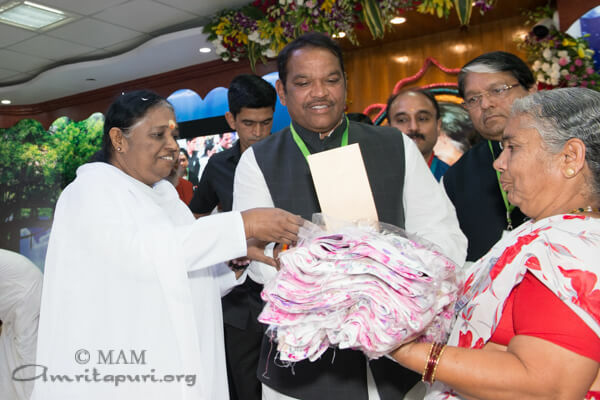 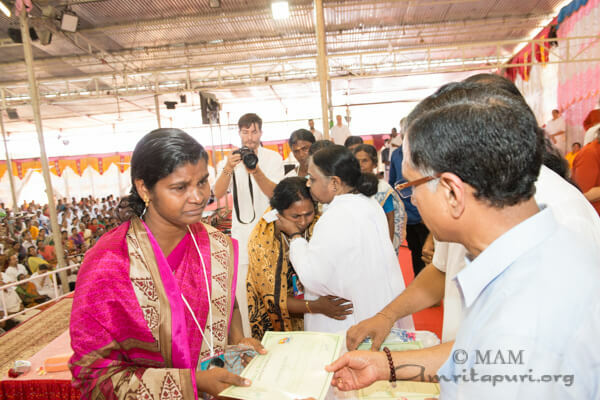 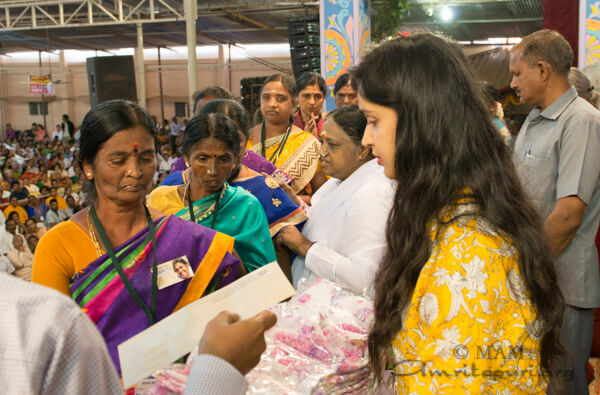 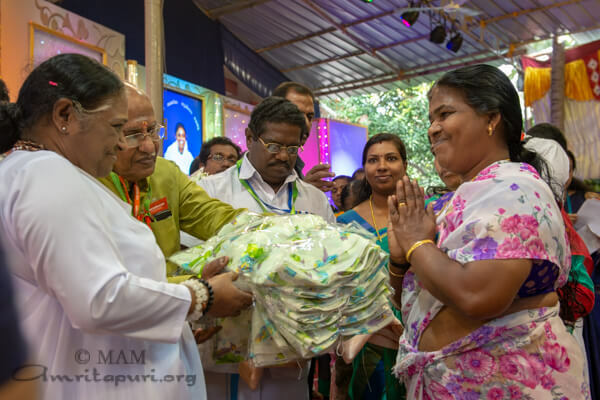 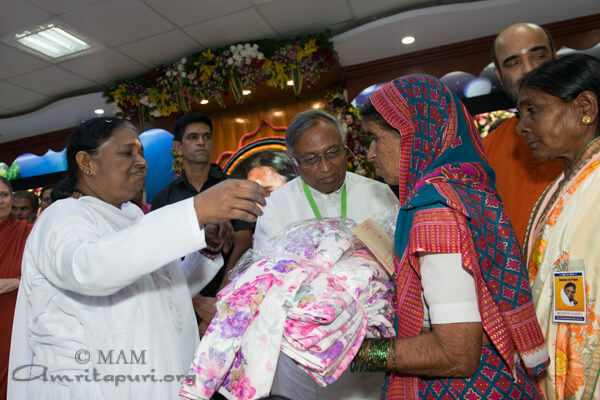 Amma gave away saris and working capital to the Amrita Sree Self-Help Group members. 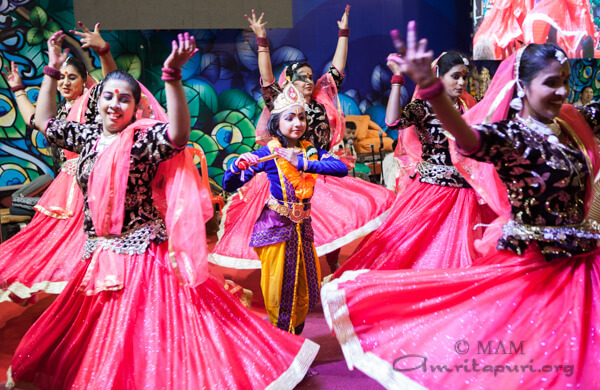 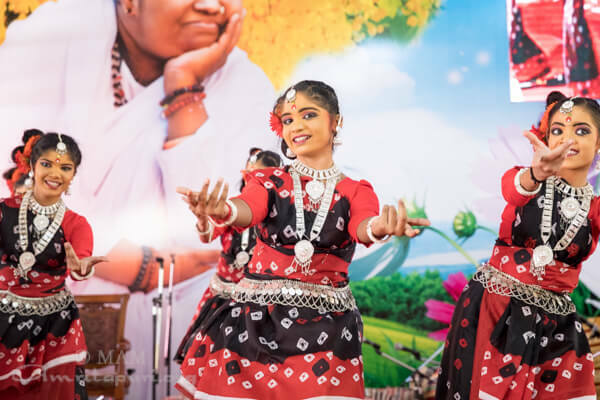 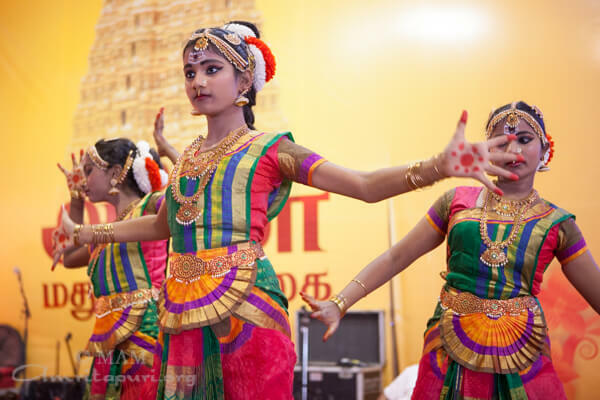 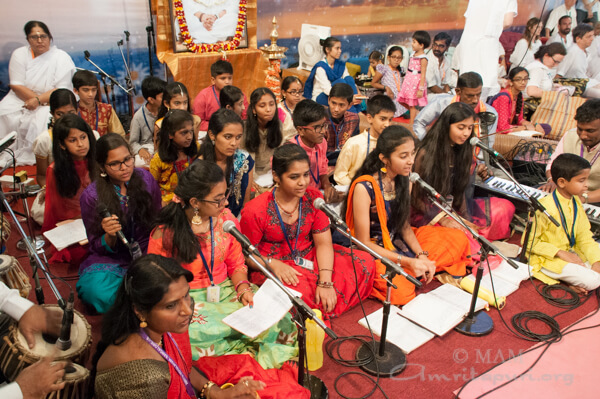 Amrita Vidyalayam and Amrita University students presented different cultural programs and bhajans on both days of the program. 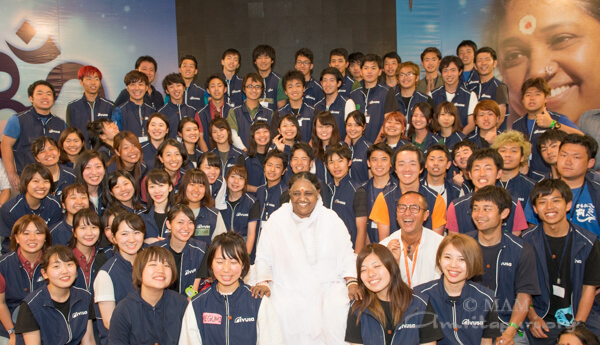 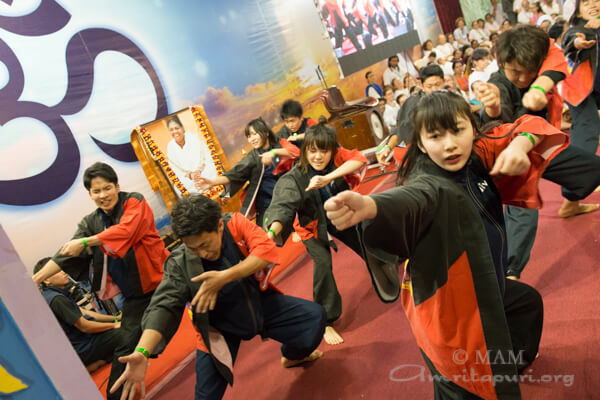 Seventy-two Japanese University students from IVUSA came for two weeks to assist in Jivamritam drinking water project of MAM. 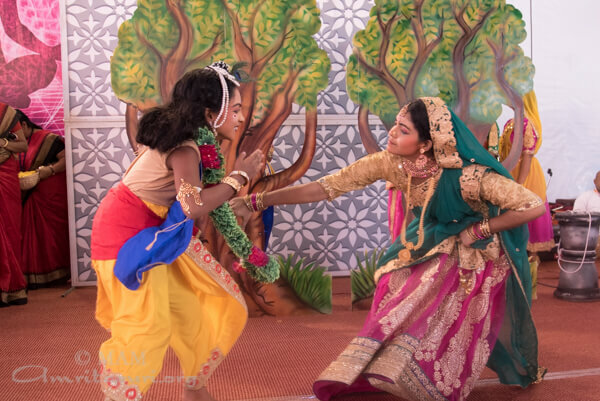 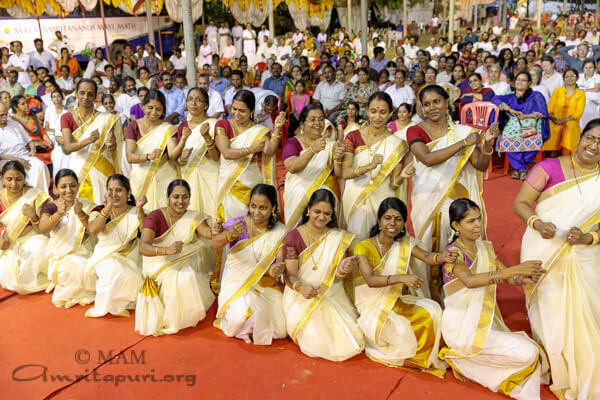 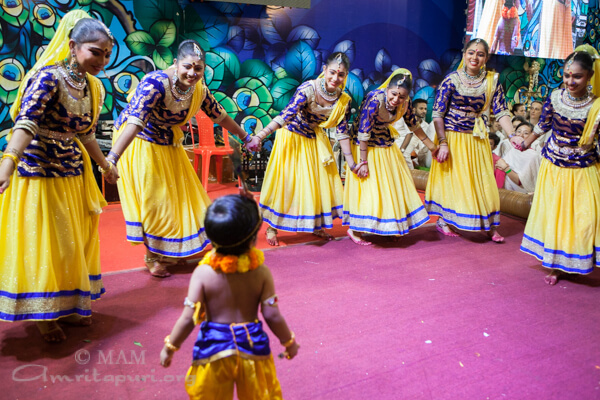 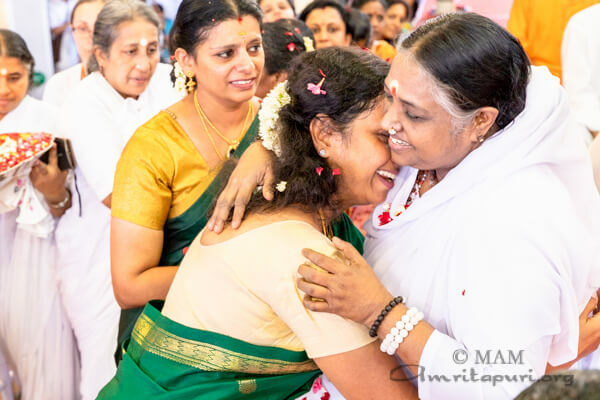 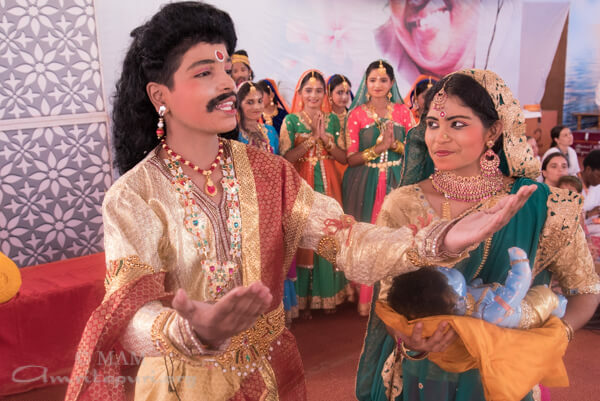 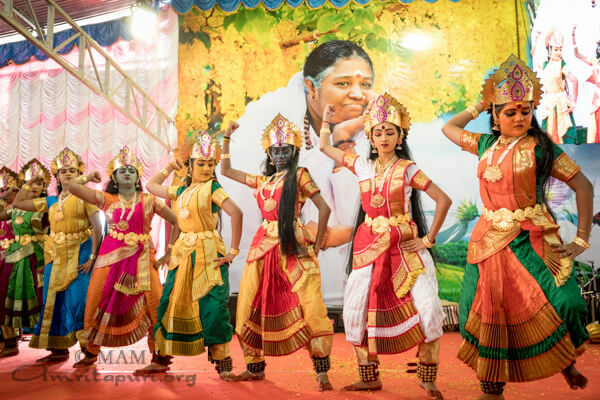 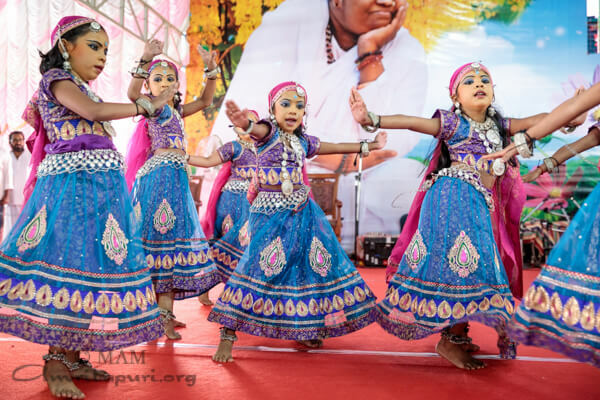 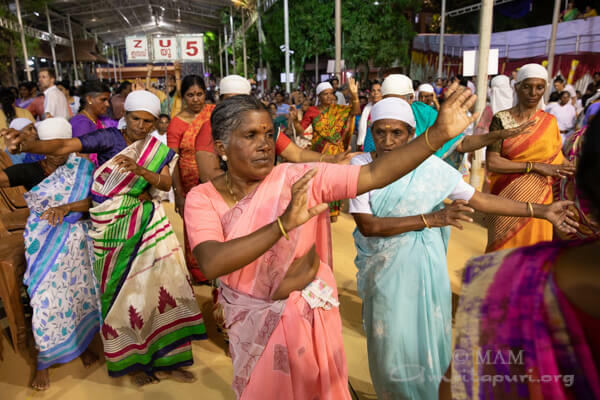 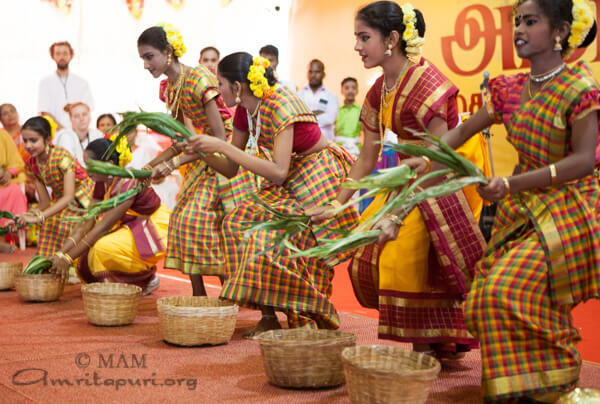 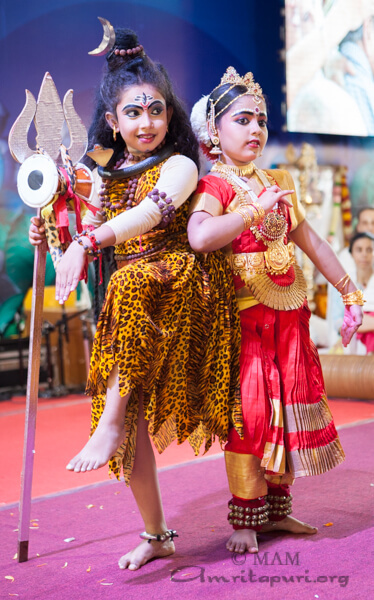 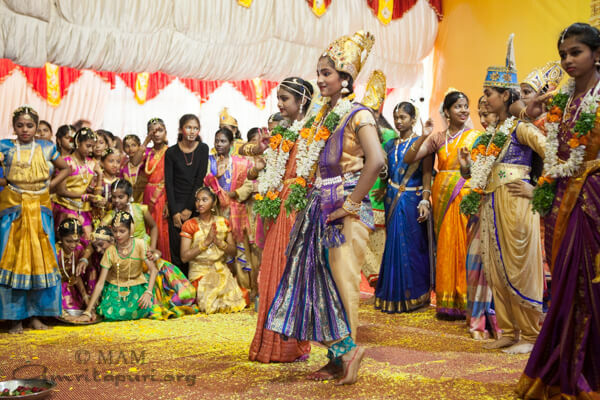 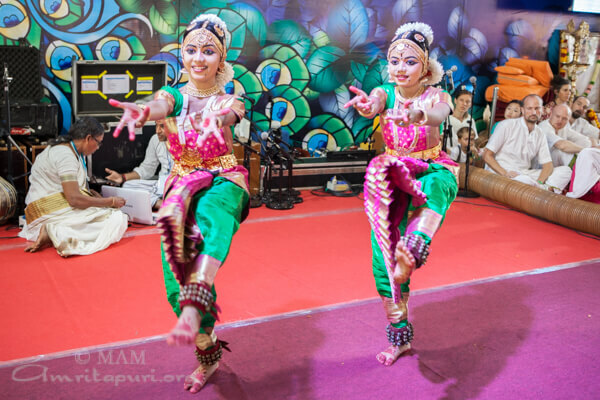 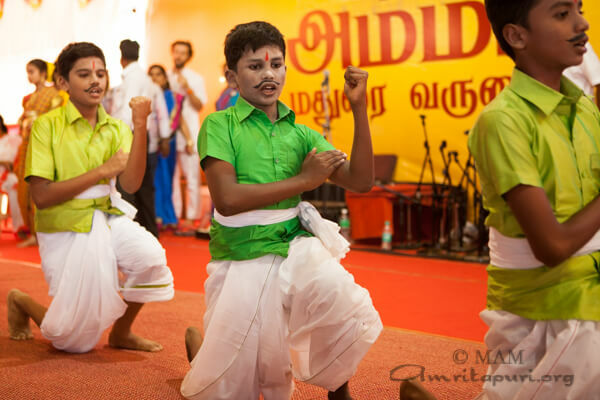 They came to meet Amma, danced for her, with full of joy and energy. 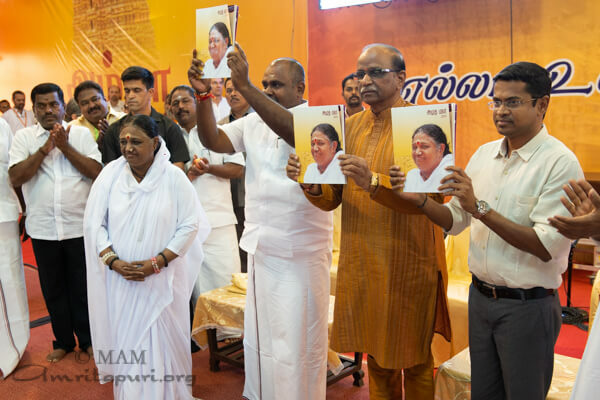 They had darshan and a photo session with Amma too. 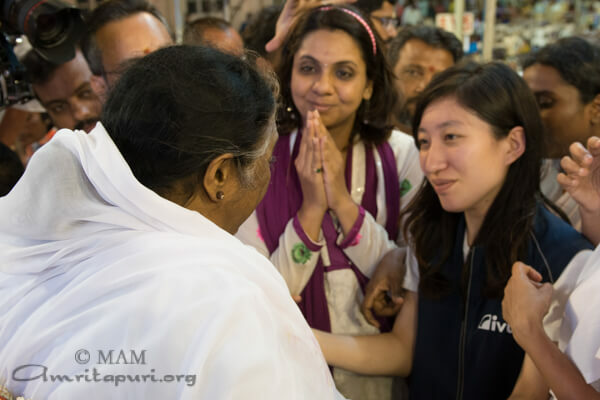 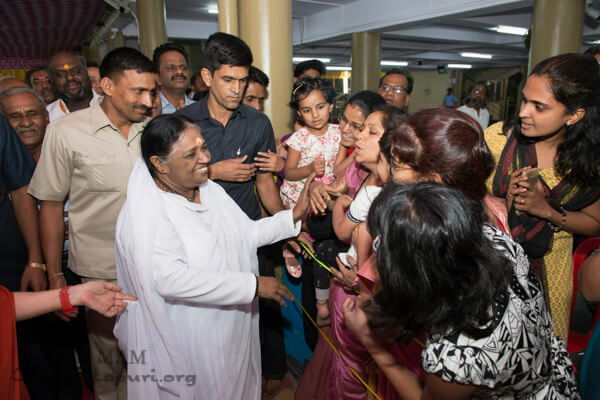 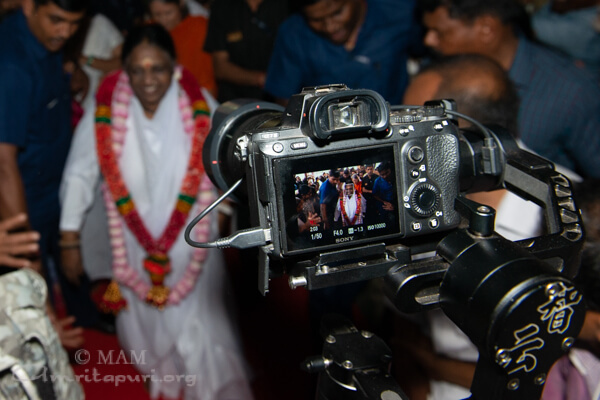 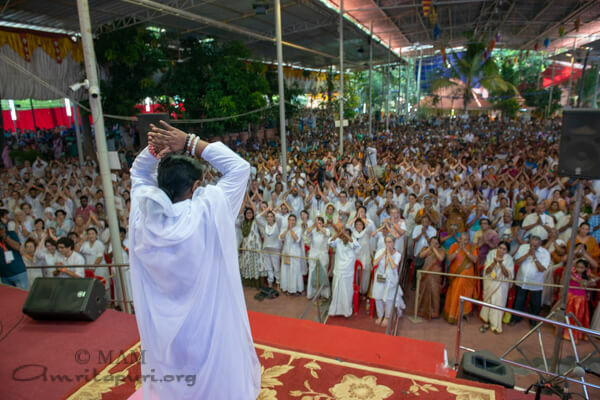 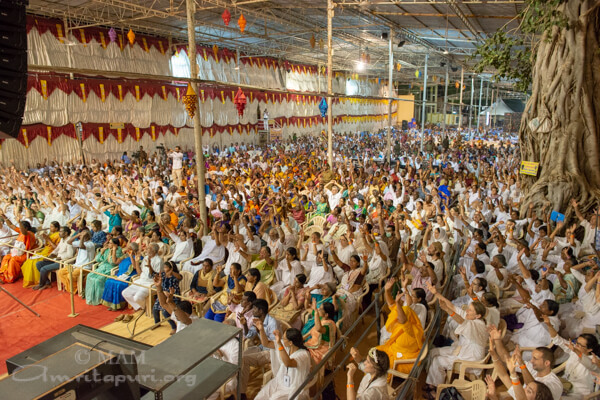 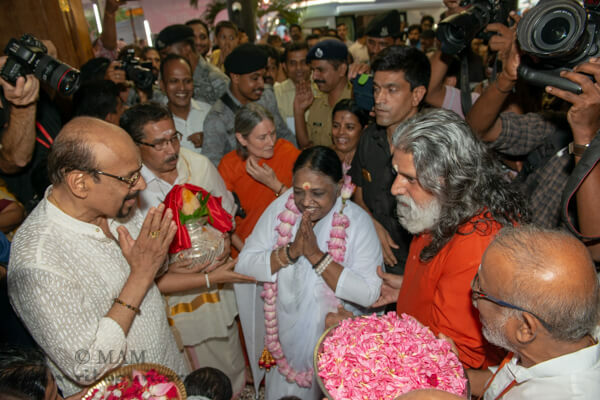 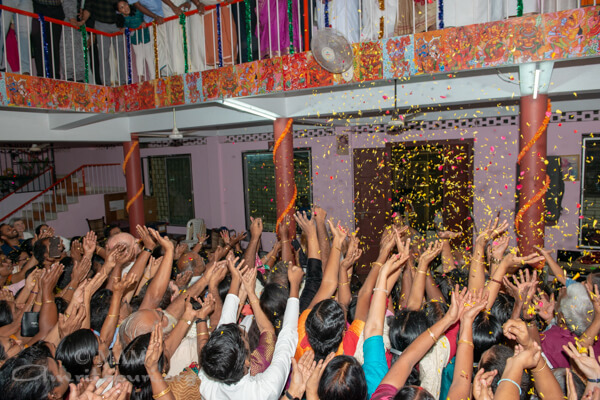 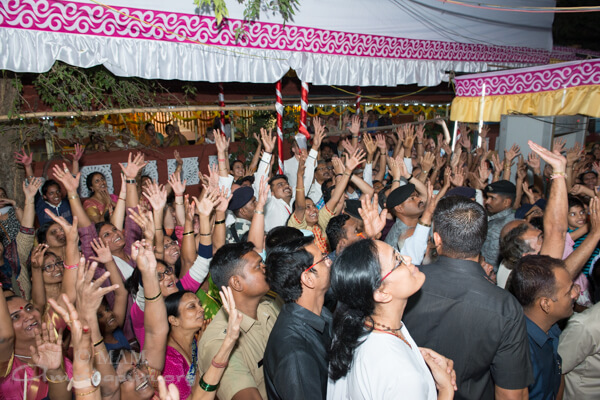 Darshan ended around 2:45AM, and Amma prepared to head out for the next stop in Hyderabad.